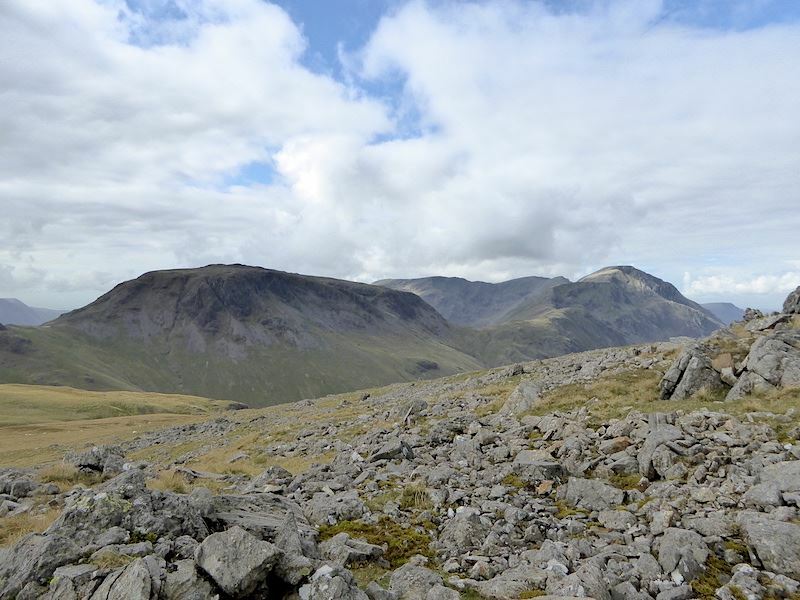 The weather forecast predicted fine, dry weather with little wind thanks to a high pressure system that is sitting over the country at the moment, and by all accounts the good weather is set to last until Friday next week, maybe even beyond that. Today began with a lovely morning. 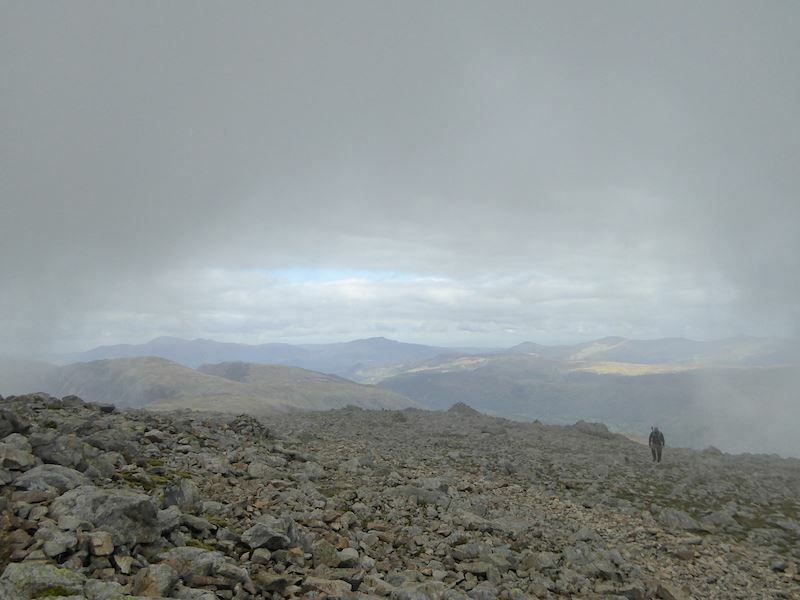 High cloud, warm without being too sunny, and no wind, all in all just right for a day’s fell walking. 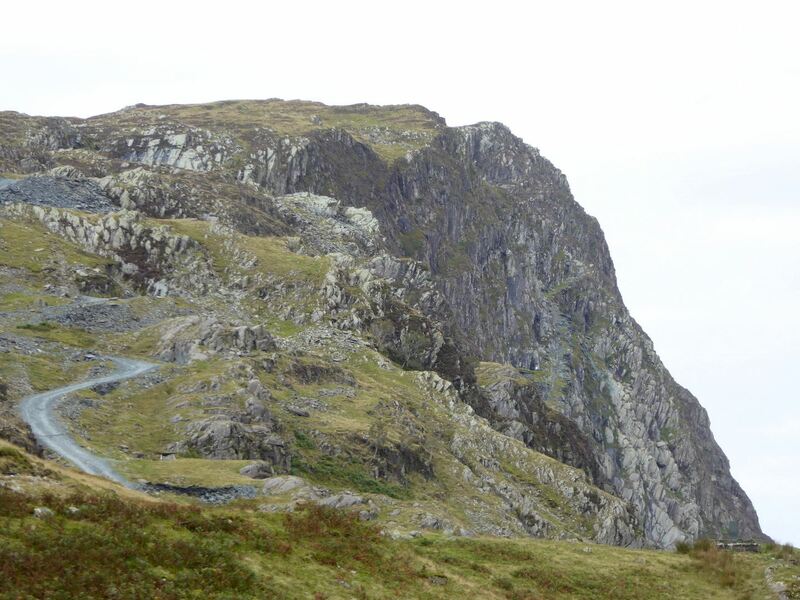 From the Honister Slate Mine car park a view of the crags of Black Star. Not many people about at the car park, we saw about half a dozen walkers setting off before us as we got ready to start off and then one chap followed us up all the way and that was it. On the path from the mine and approaching the rock cutting. This is all that remains of the old winding house, marked as ‘Drum House’ on the map at the top of the old, and long since dismantled, tramway. From the winding house a view of Grey Knotts which will be our first fell of the day. 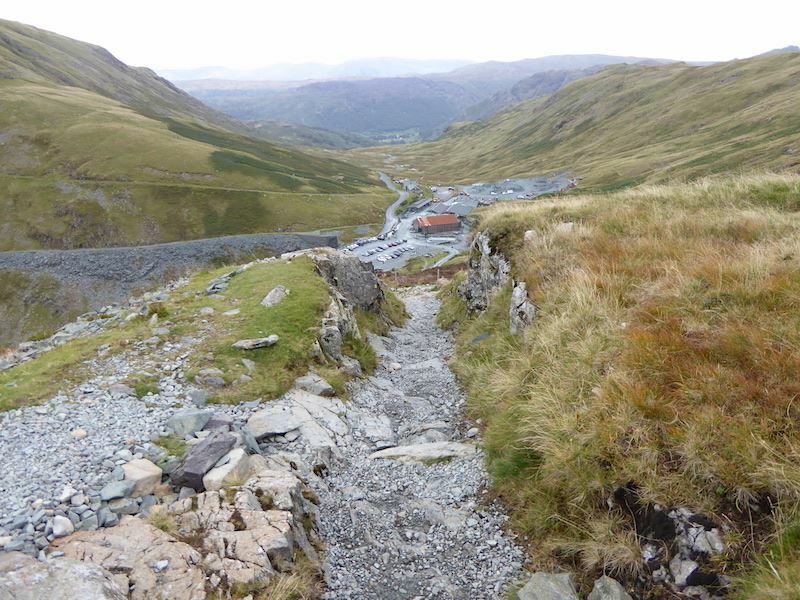 The junction of paths at the old winding house where we will take the left hand one over to Grey Knotts. 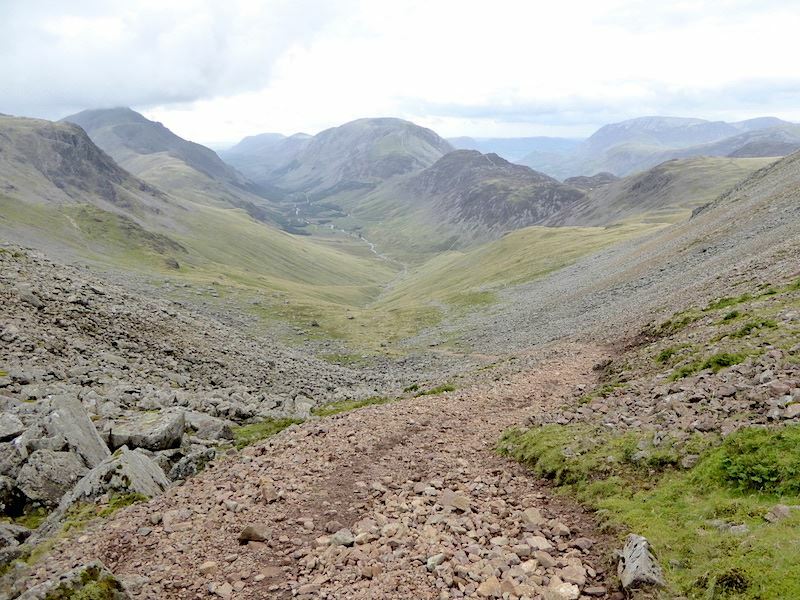 Going straight on would lead to Haystacks which is just visible behind what looks like the end of the path. 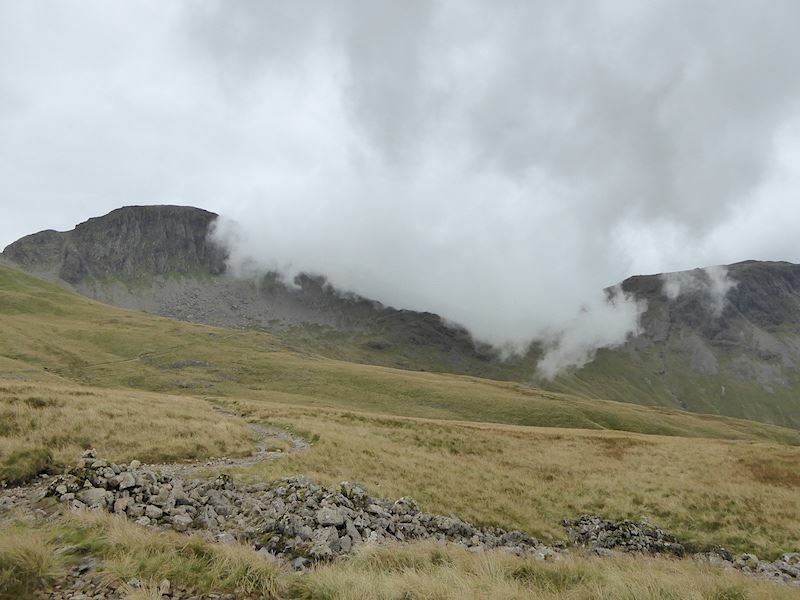 The fell with all the cloud is Pillar. 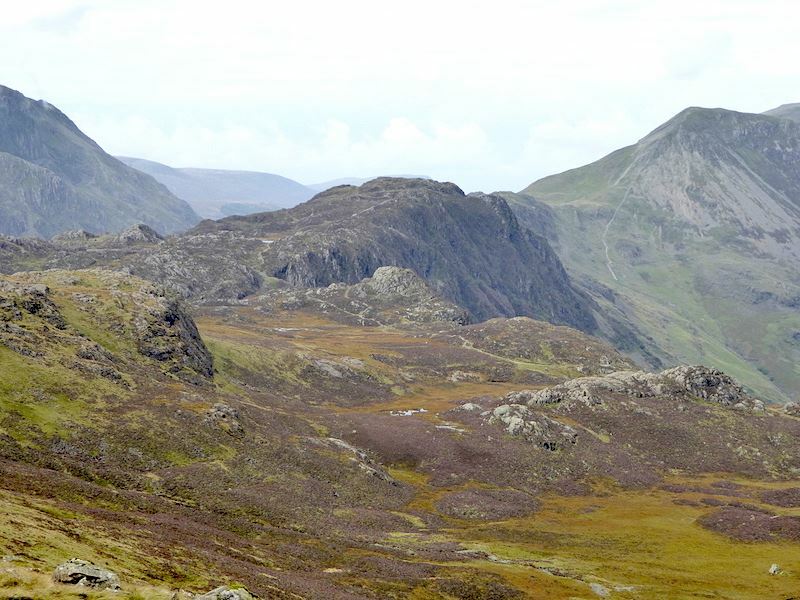 Looking across Dubs Bottom with Haystacks in the centre, to the left is Pillar, and to the right is High Crag and High Stile. 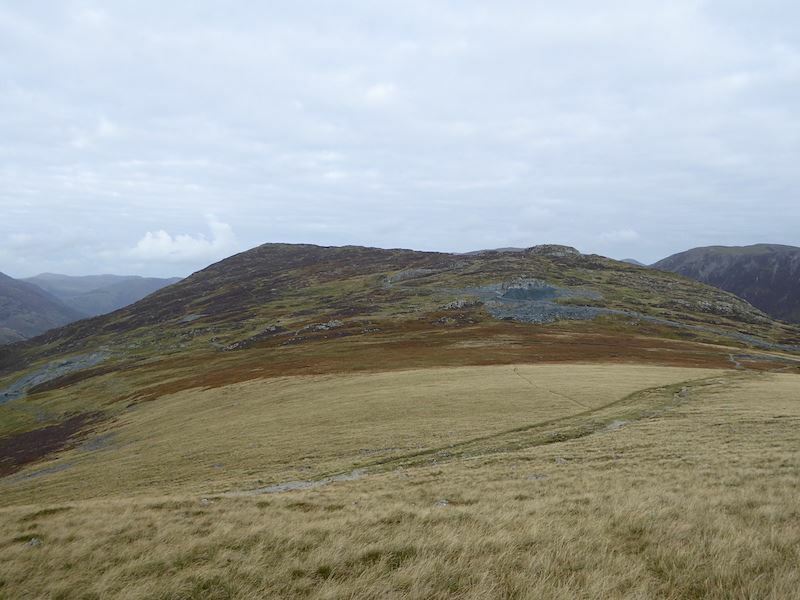 We turned off the main path after about a quarter of a mile to walk off path up the grassy slopes of Grey Knotts. No problems getting up, both the grass and the outcrops were surprisingly dry, and it didn’t take long to get up to the top. 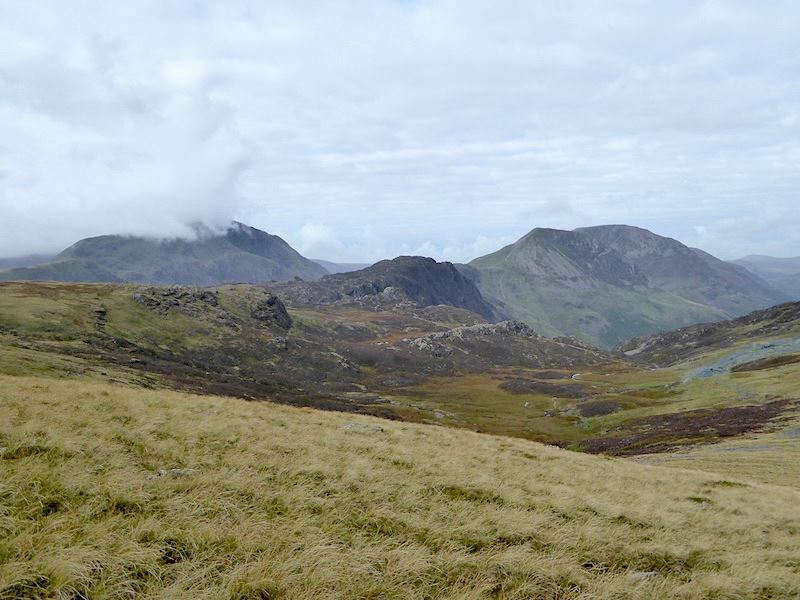 Looking across Dubs Bottom to Haystacks as we climb the slopes of Grey Knotts. 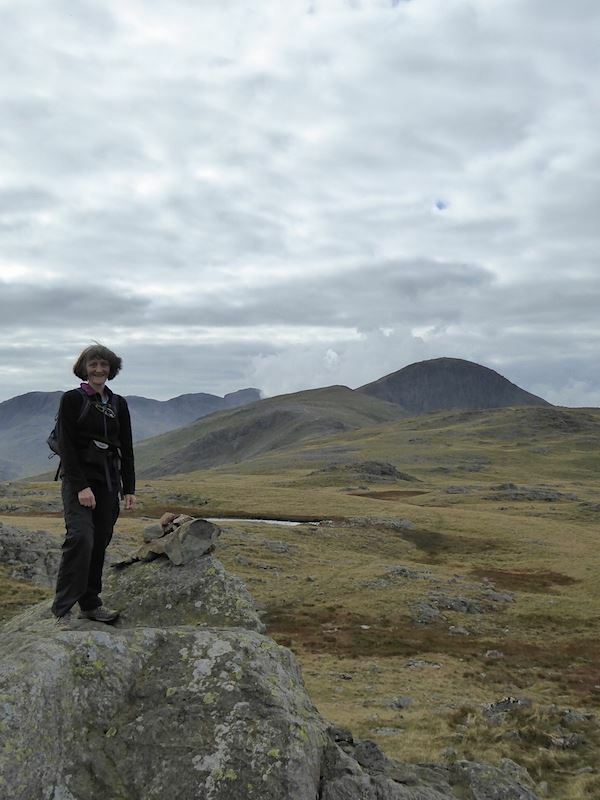 Up on the top of Grey Knotts, where we now need to locate the two rocky outcrops which mark the highest points. 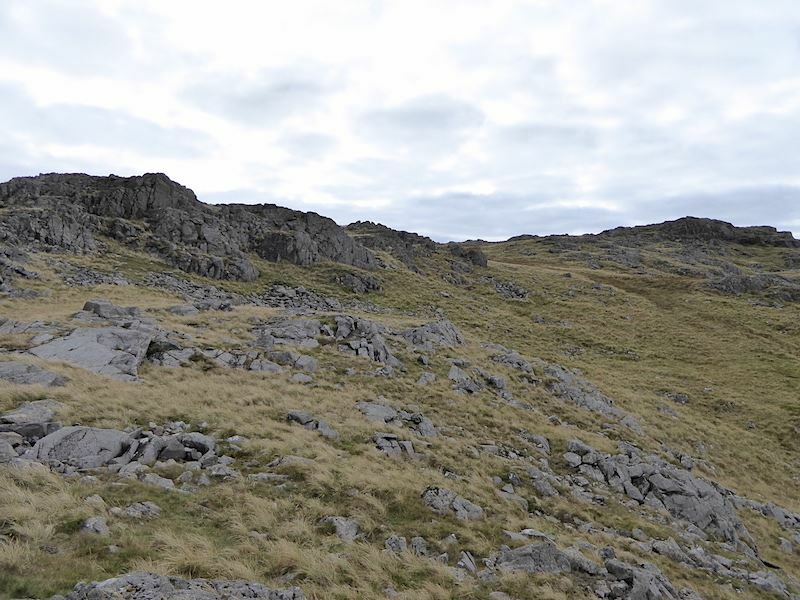 It might look as though this would be a ‘needle in a haystack’ exercise since Grey Knotts isn’t exactly short of rocky bits, but it isn’t as confusing as it might seem to begin with as many of the outcrops are quite obviously a lot lower than others. 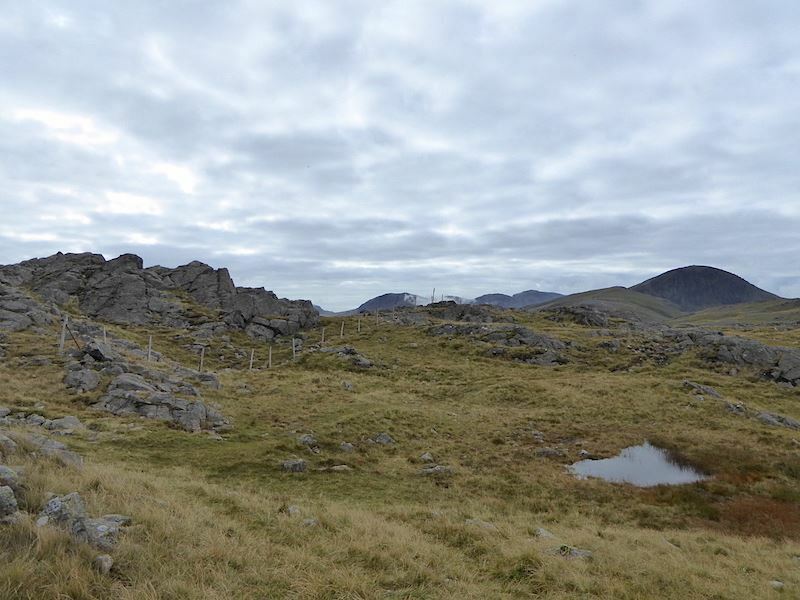 We’ll need to cross the fence to reach the first summit which is on the rocky section to the left. 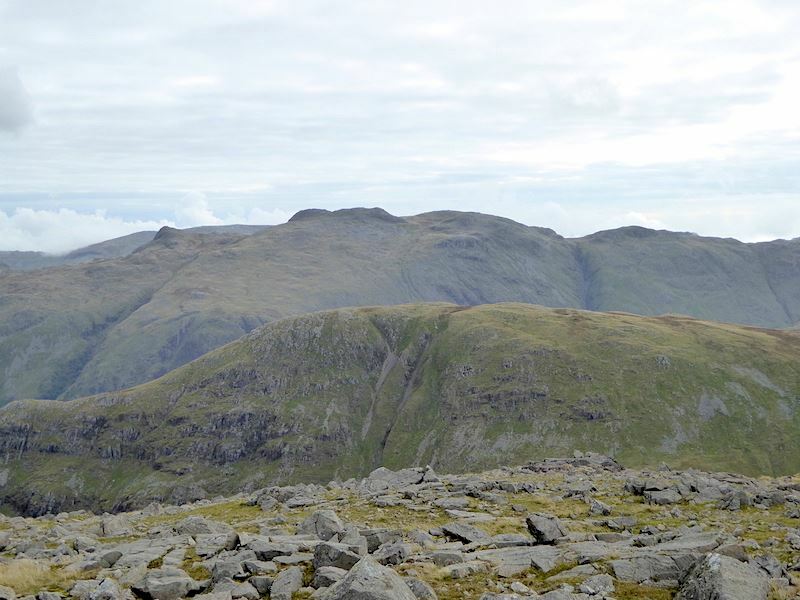 A good view of Glaramara with Combe Head just to the left of it, from the first summit on Grey Knotts. 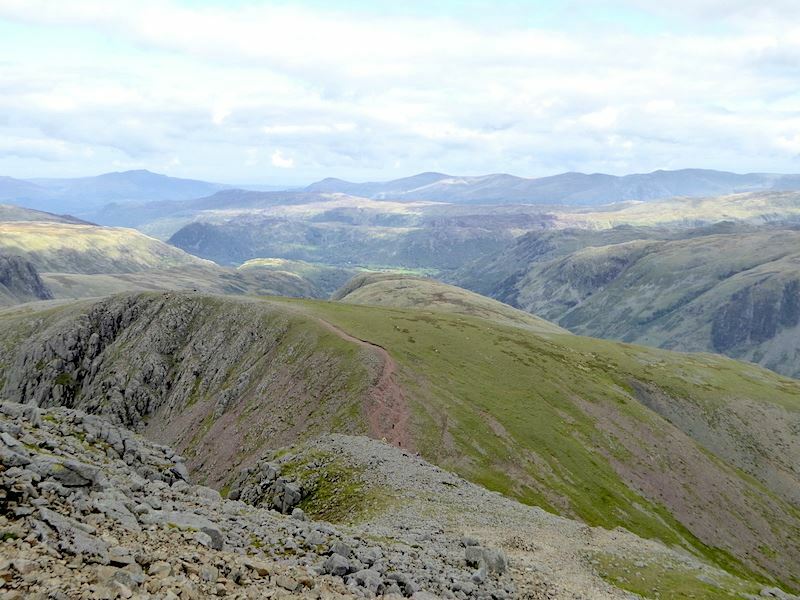 Looking south and the dominant crescent shaped fell is Great Gable, which will be the final fell on our walk today. Grey Knotts summit two, two metres higher than the other one says the GPS. Who cares, just enjoy the view. 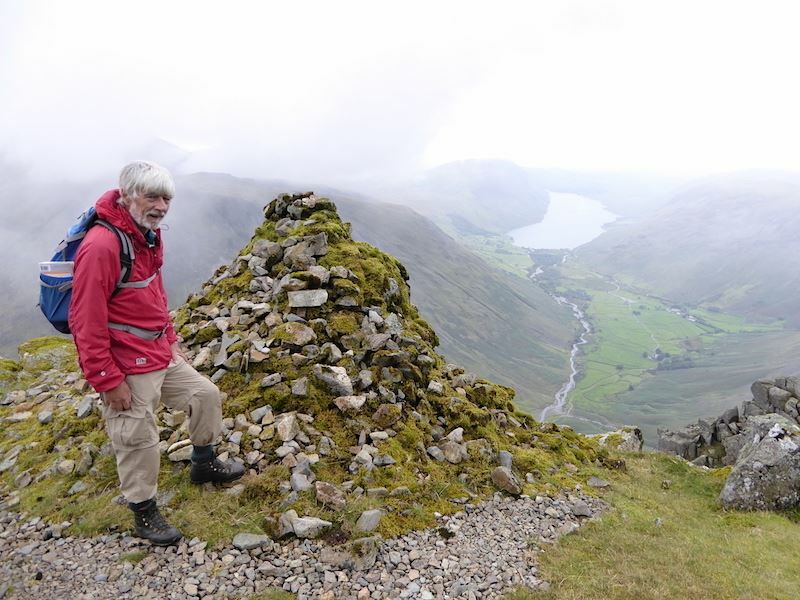 We were just getting ready to leave when a group of three or four blokes arrived, one of whom was one of those ‘jolly joker’ types, who tried to create some confusion by stating that this was Great Gable. 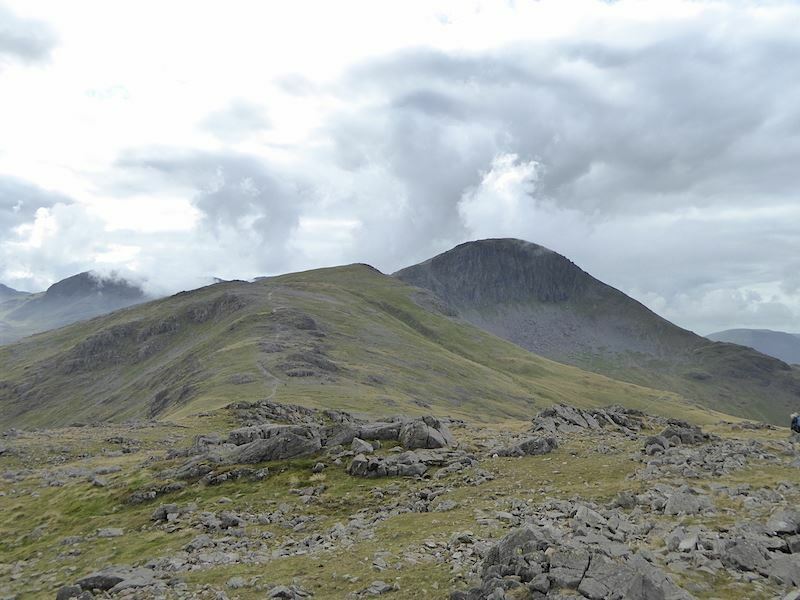 I ignored him, J told him that it was Grey Knotts so, having realised that we knew exactly where we were, he wound his neck in by saying that it only worked when the cloud was down. 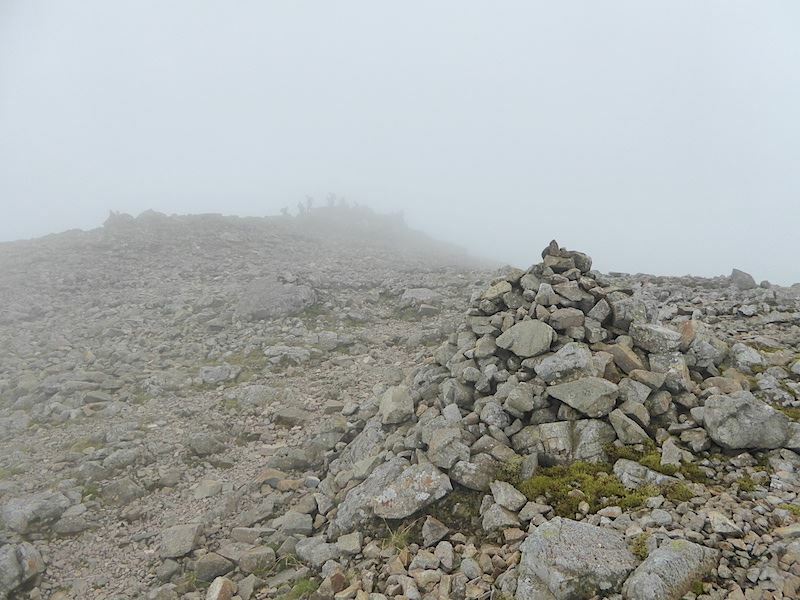 I don’t see anything funny in that either, what sort of person are you if you meet someone on a cloud covered fell and then try to mislead them about the name of it. An egotistical dickweed, and a know-all who really knew b****r all I suspect. 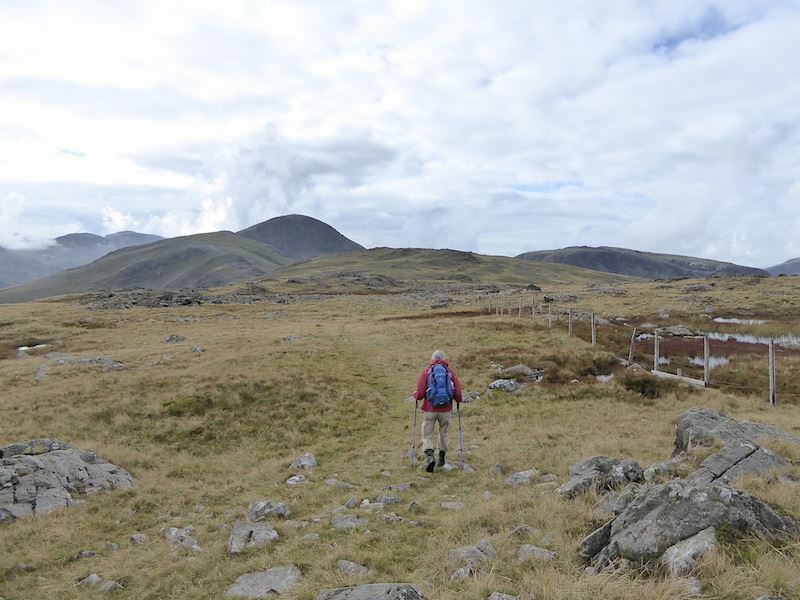 Since we were ready to leave Grey Knotts we left them to their own devices and headed for a straightforward walk over to Brandreth. 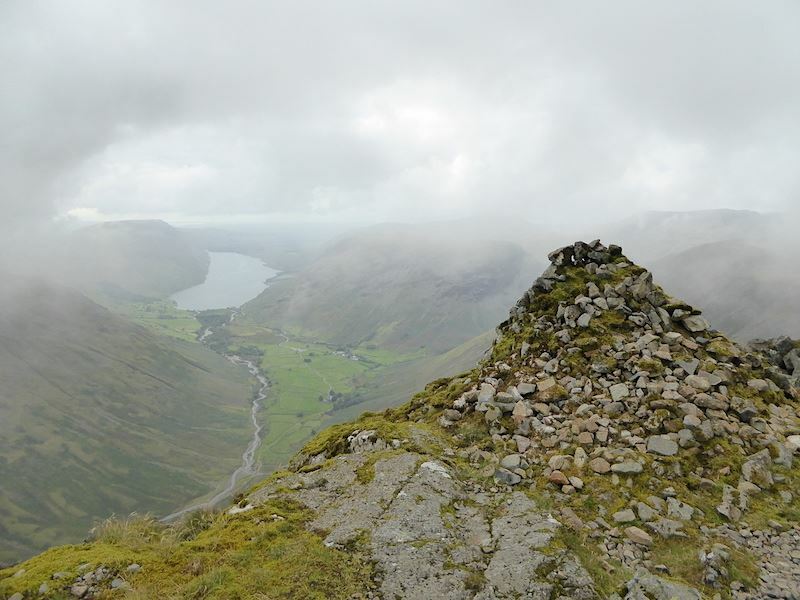 A look back at the summit of Grey Knotts, now occupied by the same group of rather noisy, and silly, male walkers. Why do some grown men behave no better than ten year old boys in a school playground when they go out in a group? 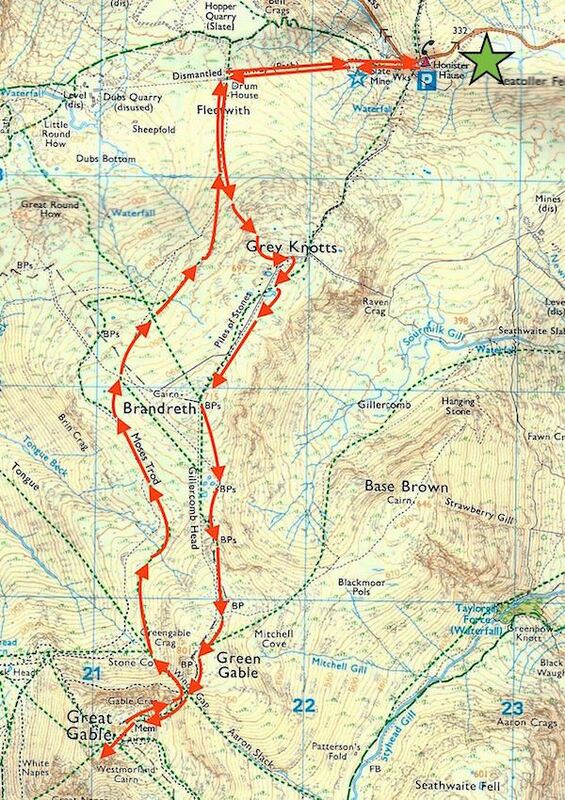 Onwards to Brandreth, just follow the fence and you can’t go wrong. 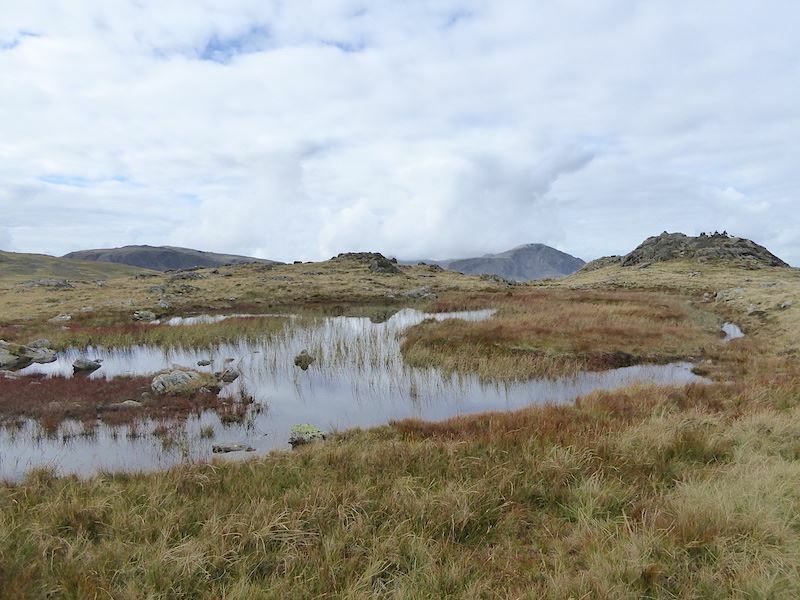 Passing the larger tarn on Grey Knotts. Its a flat area which retains a lot of water so there are a number of pools along here. 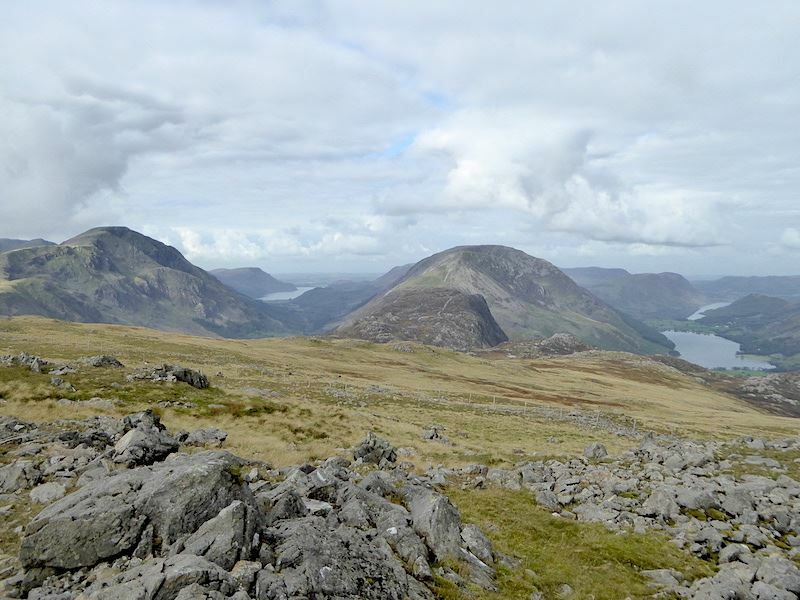 Making our way across Brandreth with Ennerdale Water over to the left of the shot, Buttermere and Crummock Water on the right and fells everywhere you look. 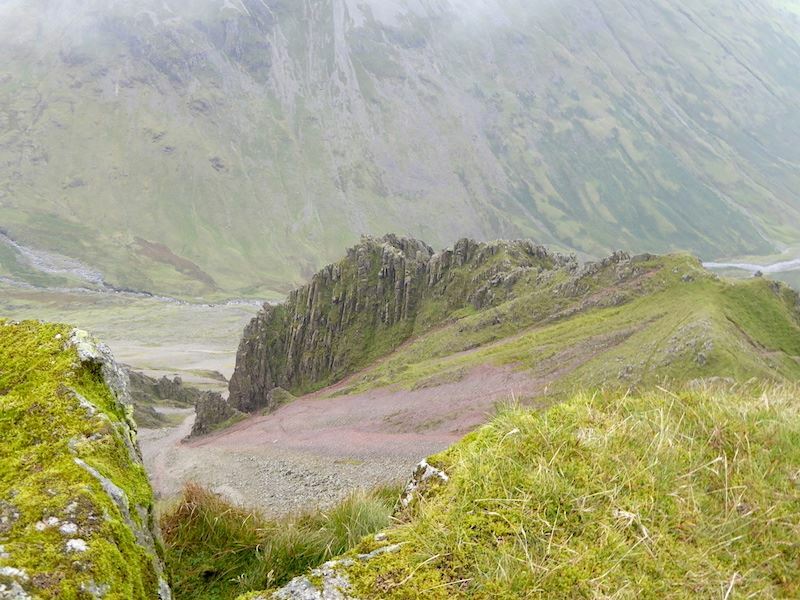 Pillar, standing out clearly now that the cloud has shifted, with Ennerdale Water to the right of it. 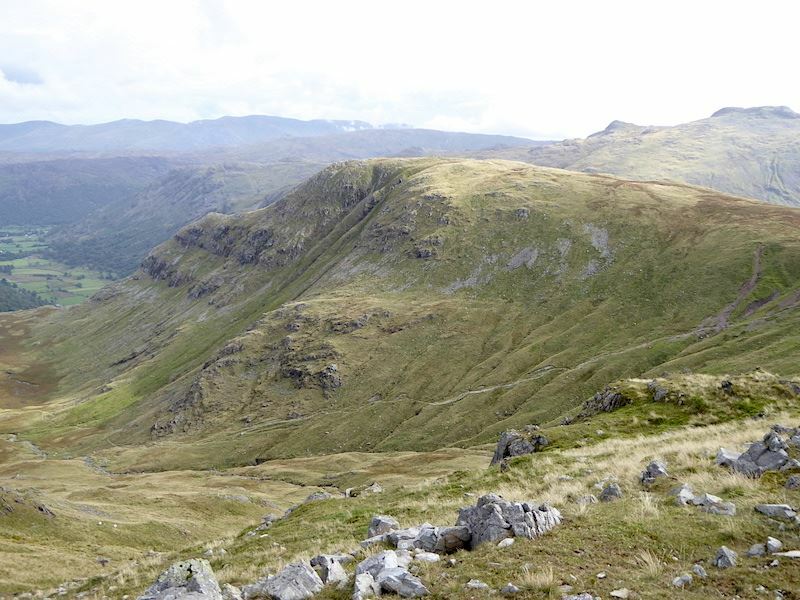 On our left we have a view of Glaramara on the skyline. 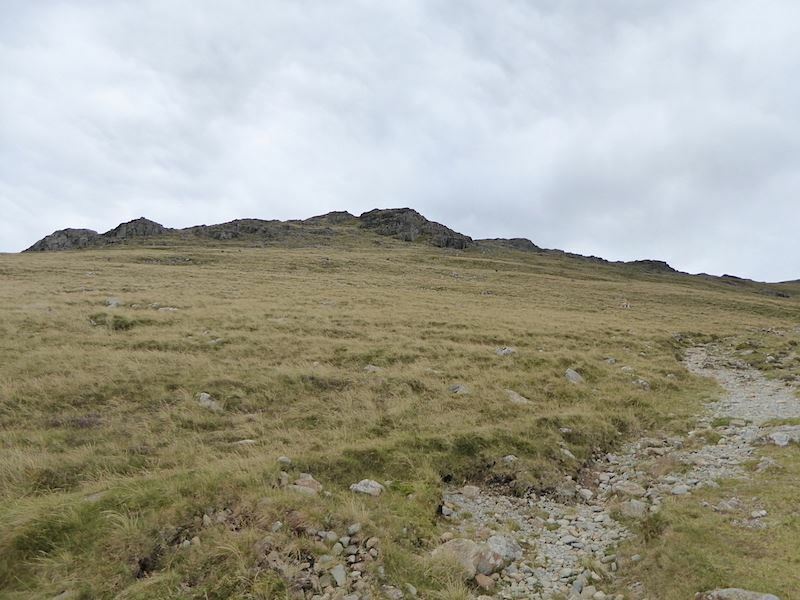 There’s nothing very remarkable about Brandreth itself and if you weren’t taking notice you could walk past the summit without noticing as the whole area is relatively flat. 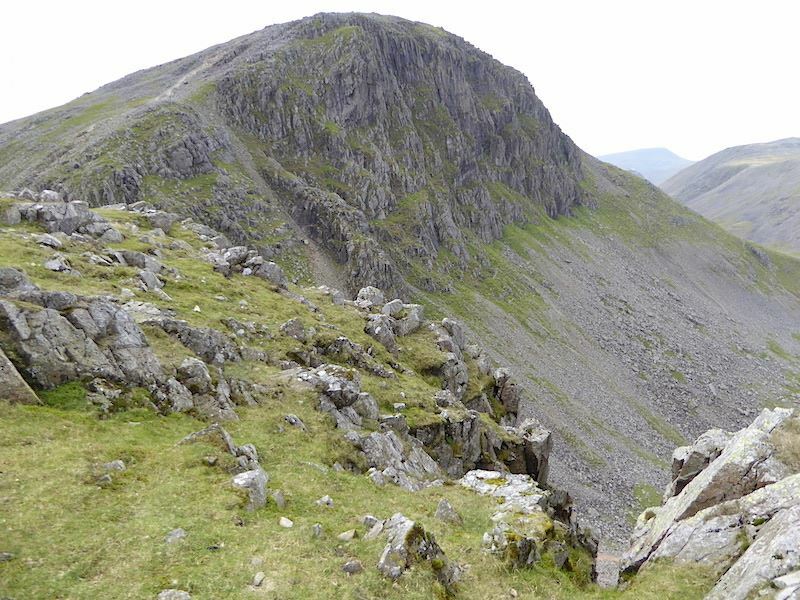 The next stop on from Brandreth will be Green Gable, which, as its name suggests, is the one with the green covered slopes directly ahead of us. 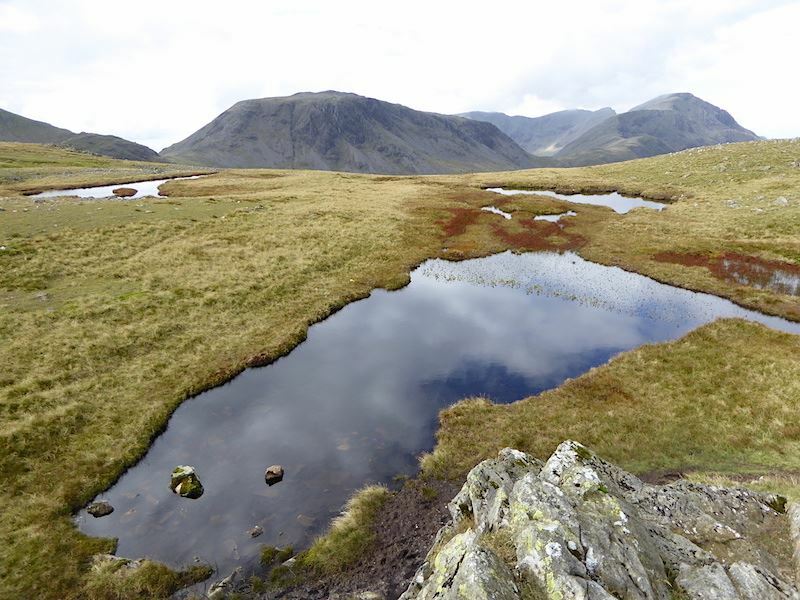 Between here and there’s a dip between the two fells, an area known as Gillercomb Head, so we have to lose some height only to have to regain it on the other side. 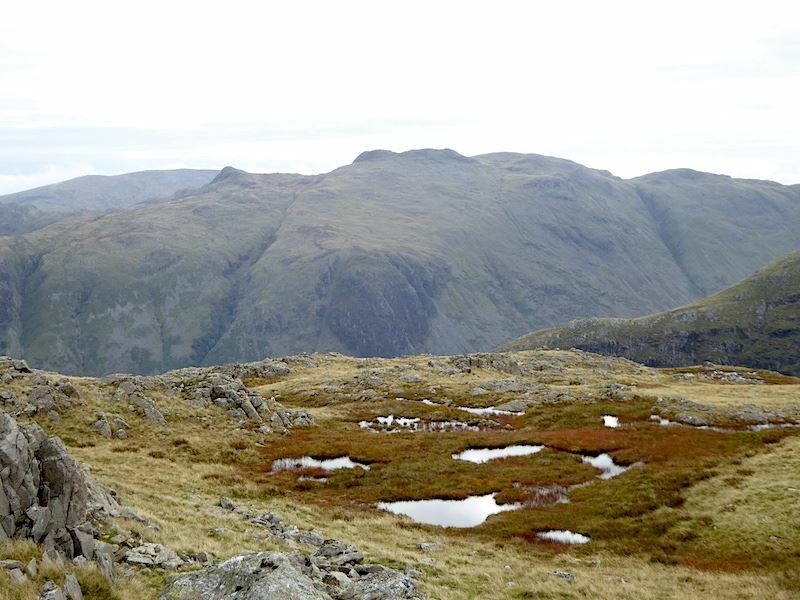 Dropping down from Brandreth now and over to our right we have a view of Kirk Fell with Pillar on its right. 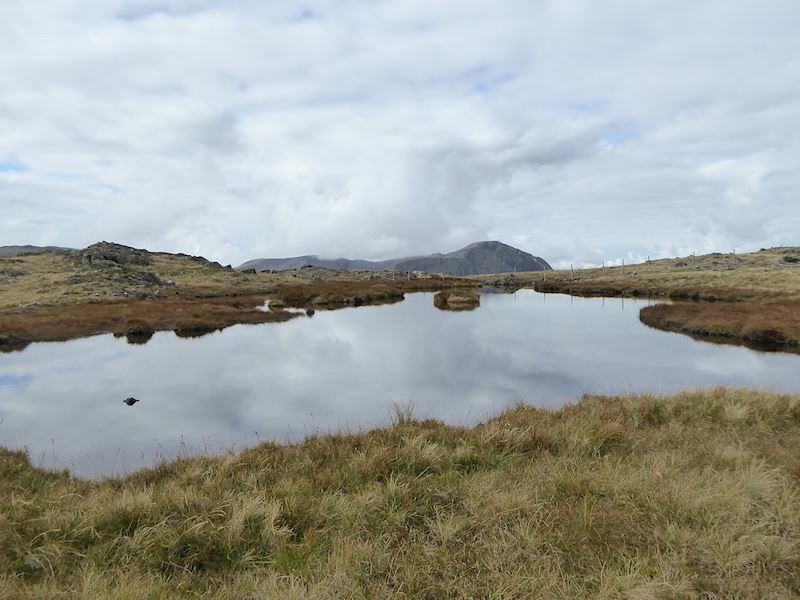 Passing by the tarns as we reach the lowest point on Gillercomb Head. 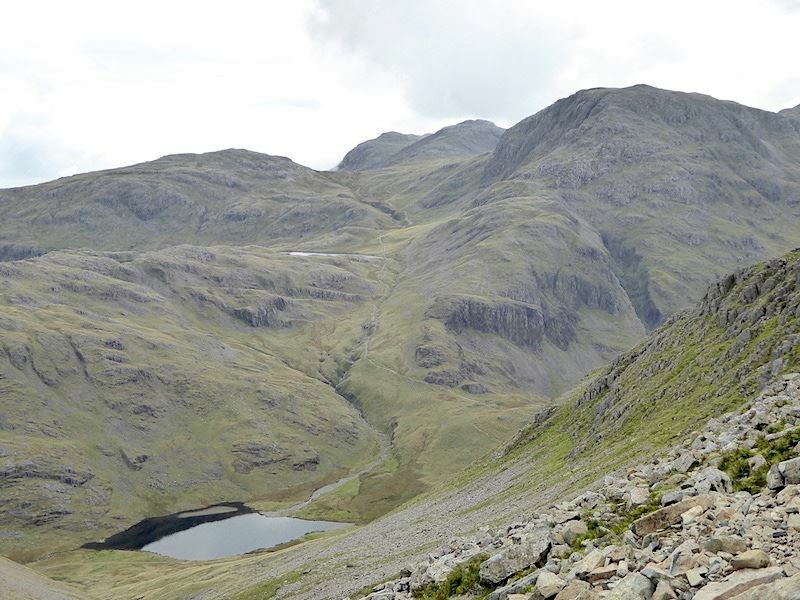 A look back at the descent route from Brandreth from just beyond the tarns. 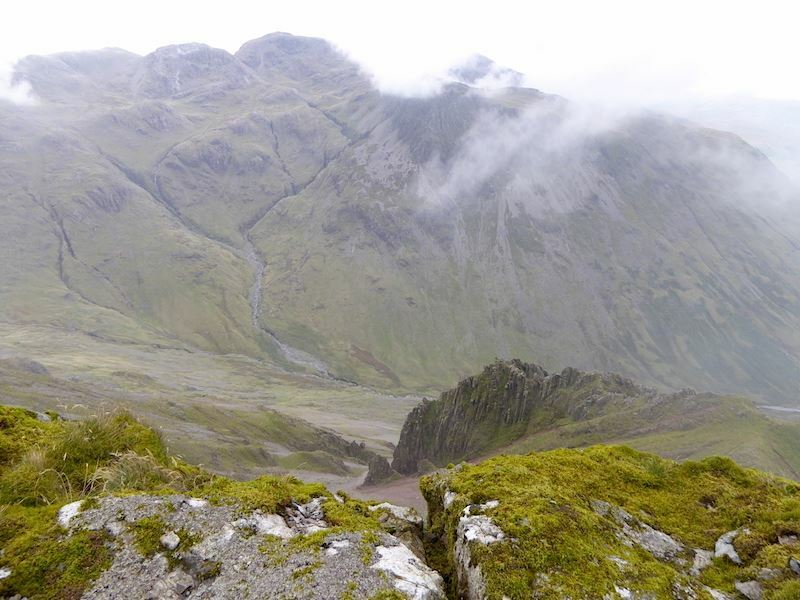 Starting the climb up Green Gable and a look down into the hanging valley of Gillercomb. 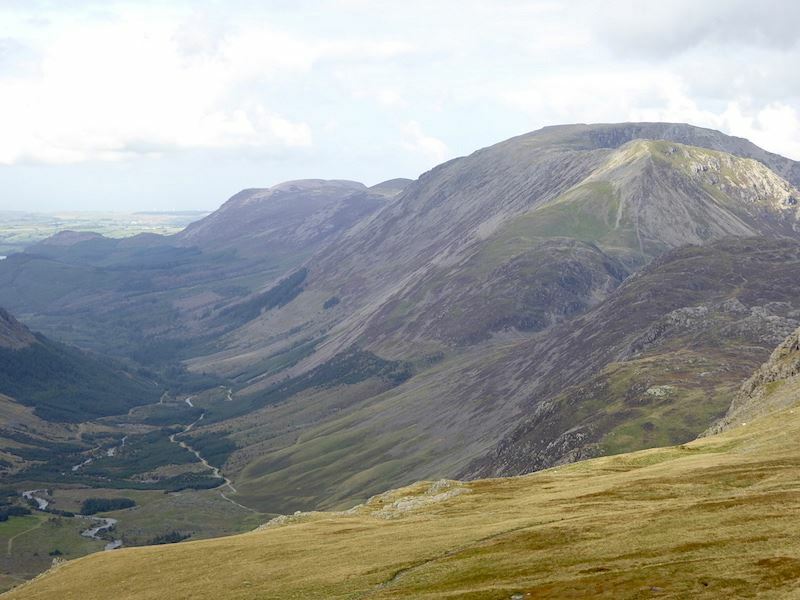 Raven Crag on the left is known to climbers as Gillercomb Buttress. 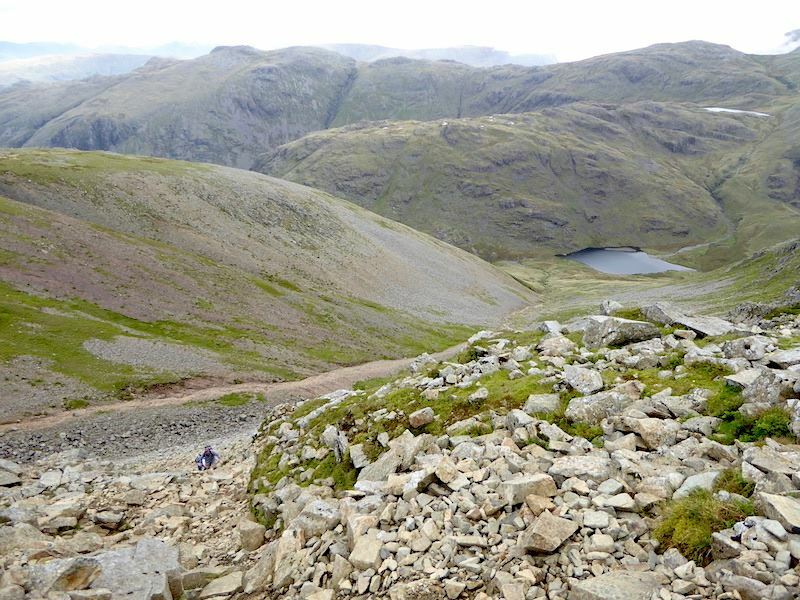 The surrounding scenery provides plenty of interest which relieves the tedium of the somewhat dull trudge up Green Gable. 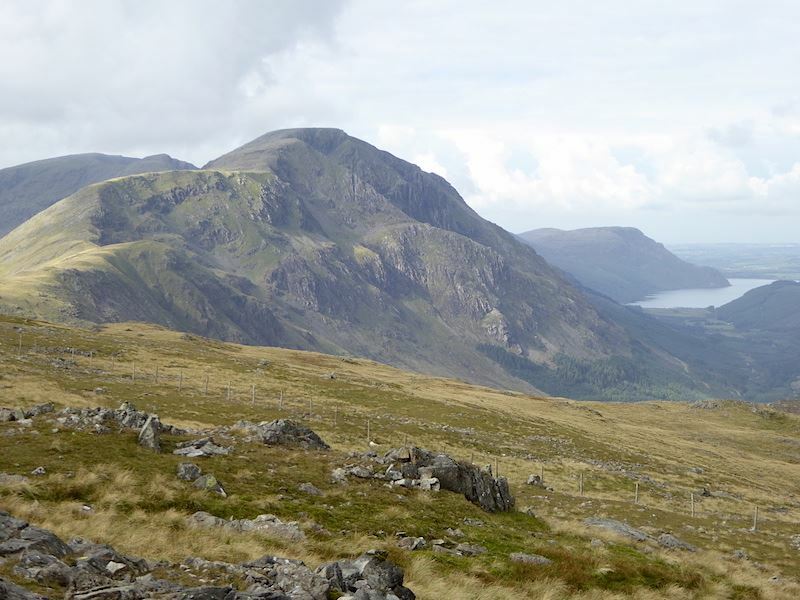 Here’s a few shots taken on the way up …..
….. Base Brown in front of Glaramara, both getting a splash of sunshine …..
….. looking straight down Ennerdale …..
….. on the skyline and sandwiched between Kirk Fell and Pillar is the western section of the Mosedale Horseshoe …..
….. with a closer look at Pillar …..
….. a view along Ennerdale with the slopes of High Crag and High Stile rising on the right …..
….. a close up of Bowfell and Esk Pike …..
No chance of missing the path up Green Gable, cairns marking the route all the way. I think the shot might explain why I think this a dull trudge, there’s nothing of much interest ahead and the path seems never-ending. 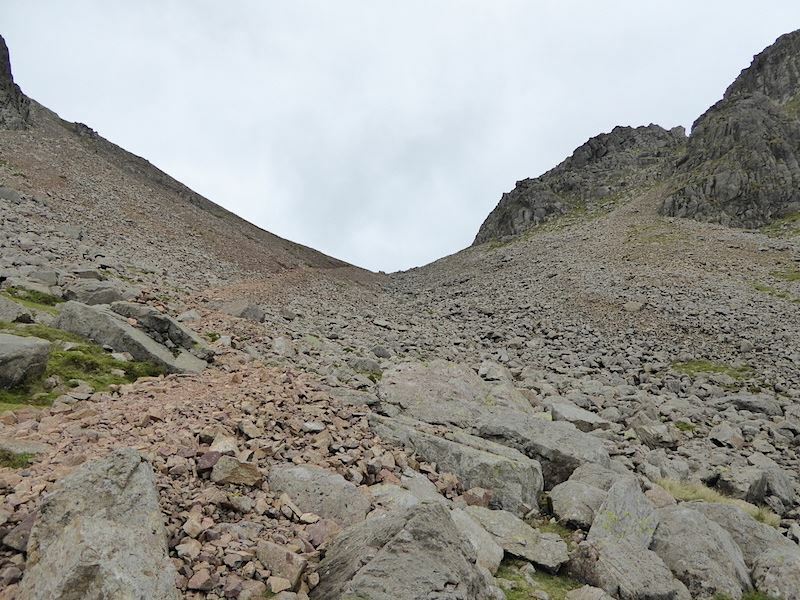 But end it does, and then the very impressive crags of Great Gable rear up before you. 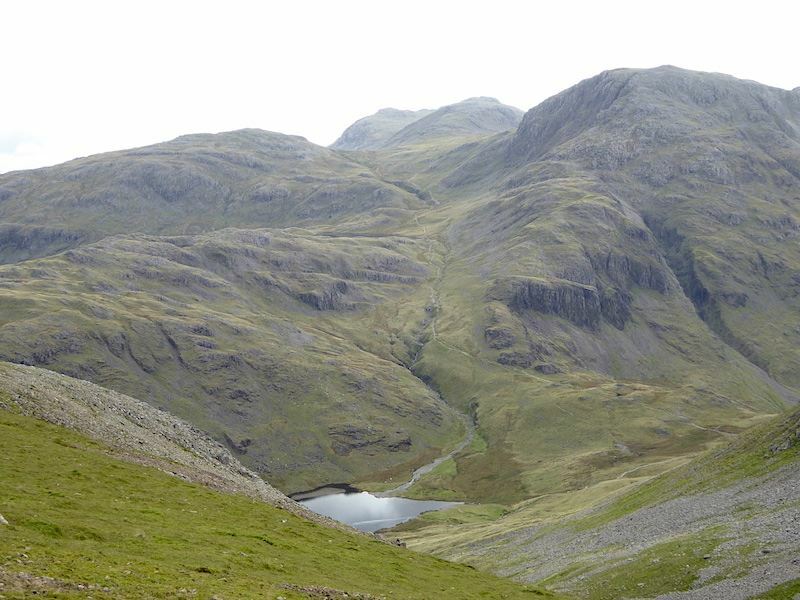 From Green Gable this is the the view to the west, there are some big fells around these parts. 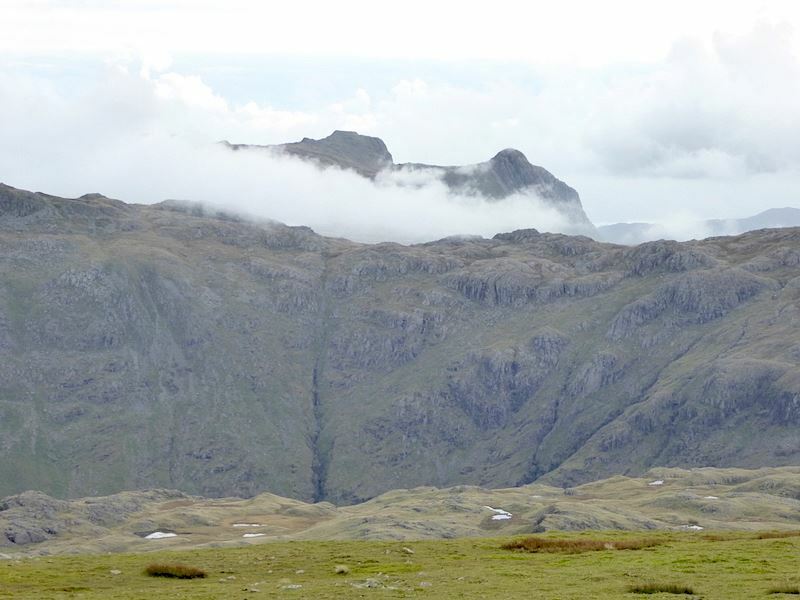 There’s even a view of the Langdale Pikes so I took a close up of them as the cloud drifted below them for a moment or two. 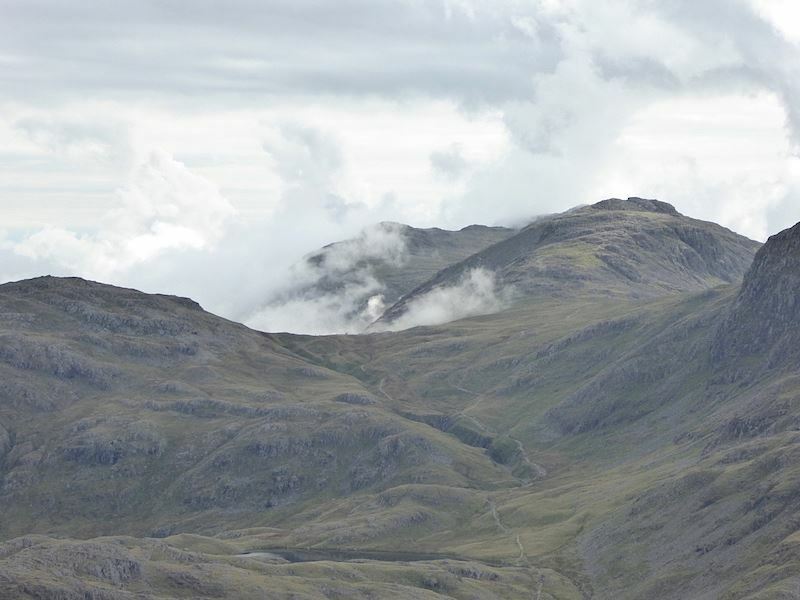 The cloud was also rising up between Bowfell and Esk Pike. 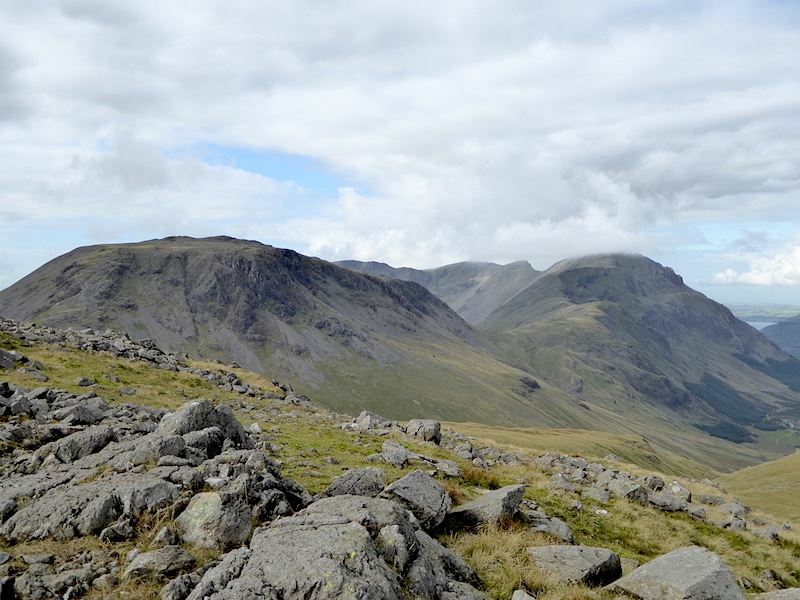 Amazingly, there were cloud free tops from Great End, on the left, right across to Scafell Pike over on the right. 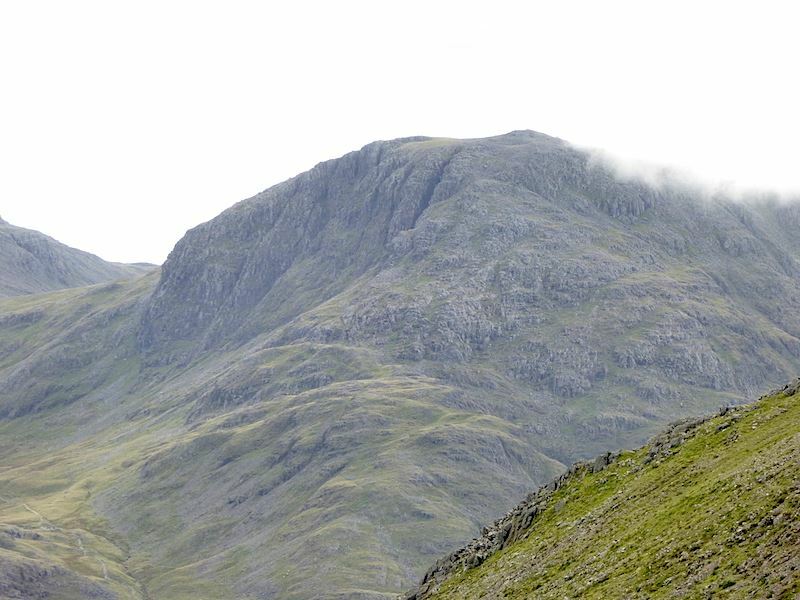 Taking advantage of the moment for a close up of Broad Crag with Scafell Pike towering above it. 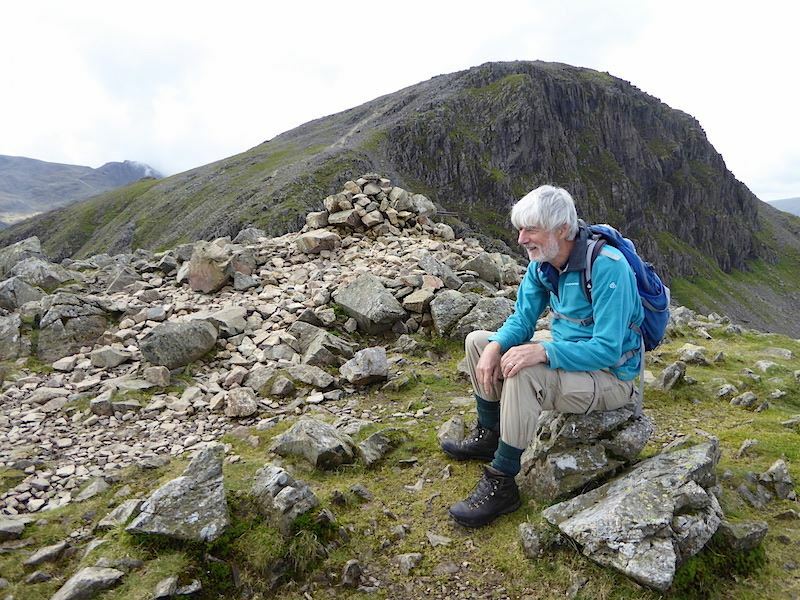 Time for a five minute sit down on Green Gable before we tackle Great Gable. 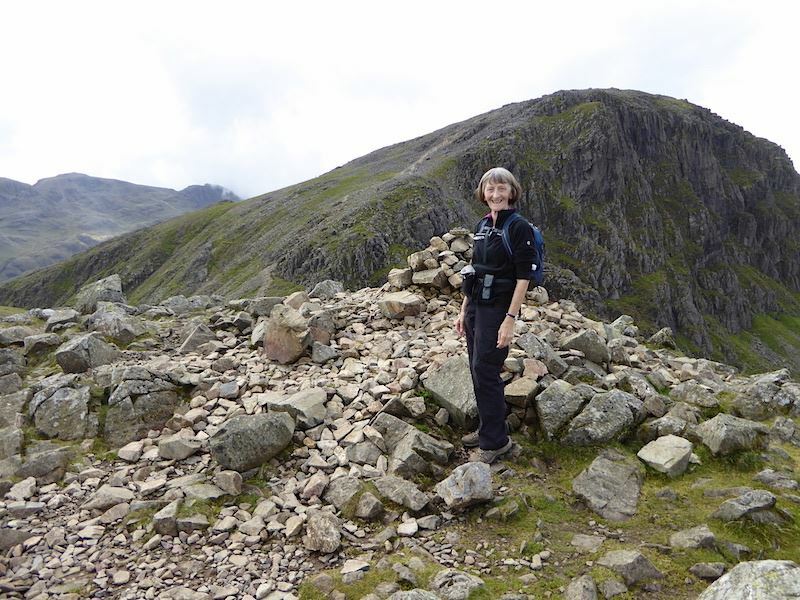 Why am I smiling, I’ve got to get up that big lump of rock behind me next? 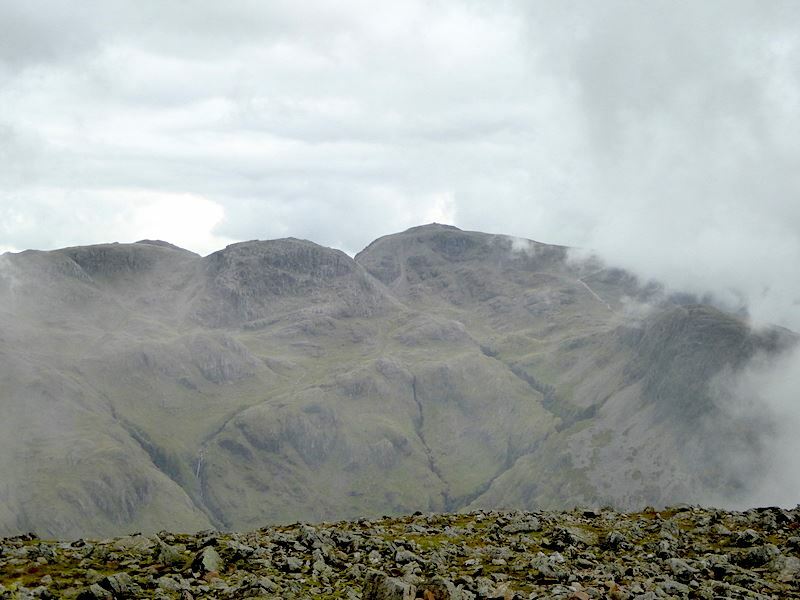 Great Gable and its imposing crags. A wall of deeply gouged, vertical brooding rock staring straight back at you. 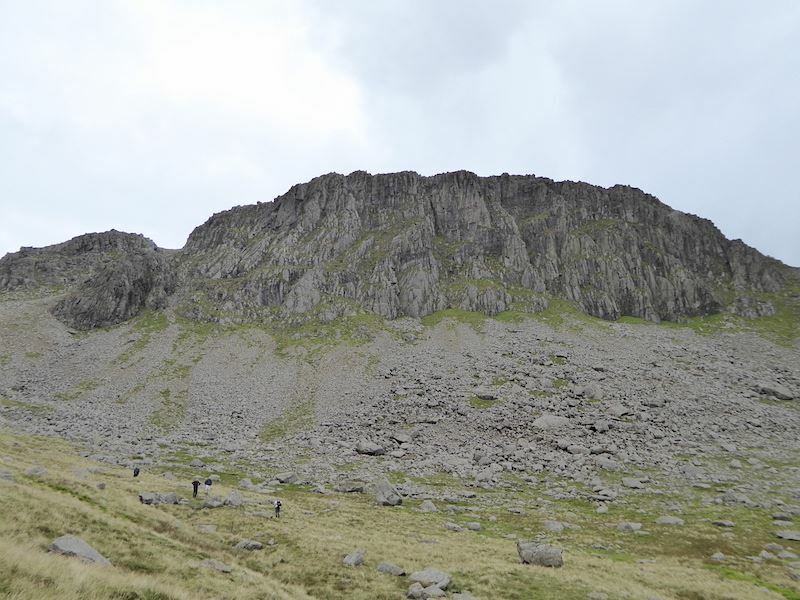 The southern face, on the far side of the summit, is even more intimidating. Making our way down the slippery slope to Windy Gap. 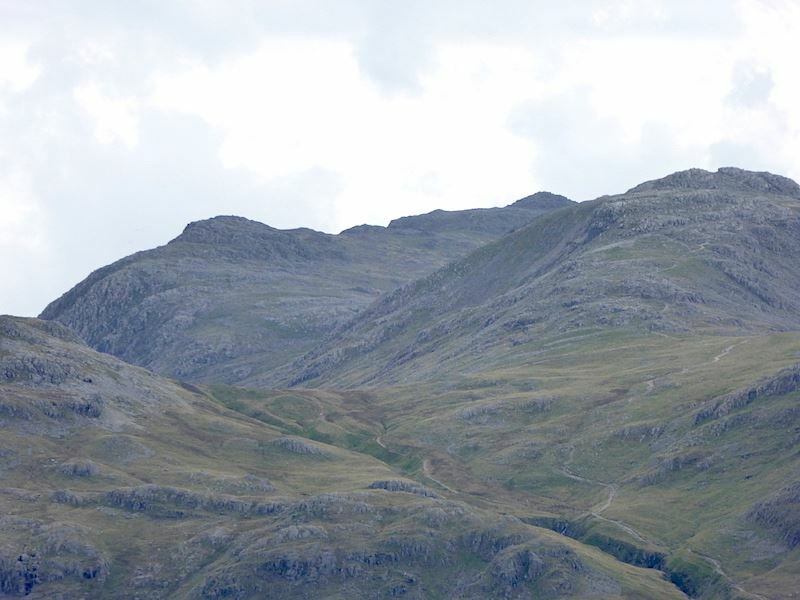 The walker down at the bottom was wearing only his boots and a pair of shorts, no doubt due to having just sweated his way up the very steep path on the left. I thought we had encountered the famous ‘naked walker’ but when he got a bit closer I could see it wasn’t him. He had a rucksack on his back and I did wonder if not wearing a t shirt was wise since rucksack straps can start to chafe the skin after a while, especially if you are sweating. 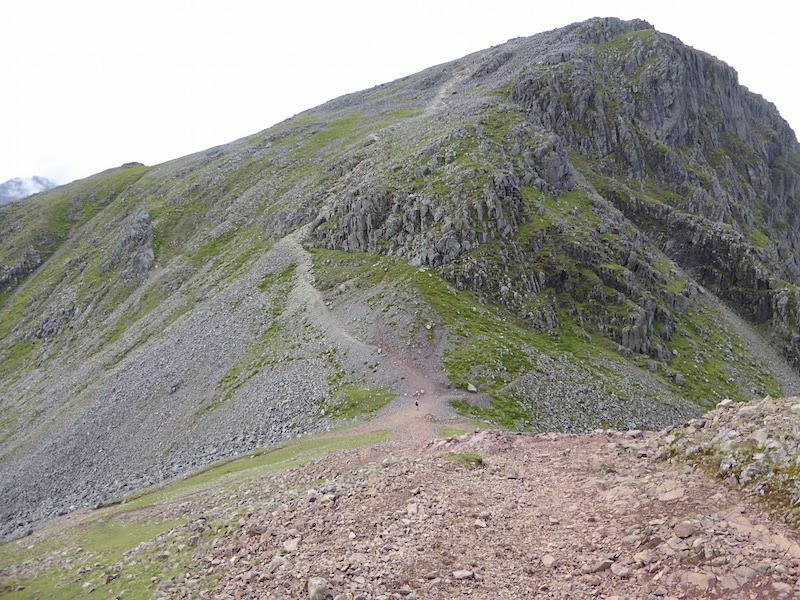 From Windy Gap he started up the path to Great Gable just as we were going to do. We were still only halfway down Windy Gap when we noticed him leave the path he was on and move left over to a grassy area, stood a few minutes looking up and then moved back to the original path again and continued looking up at it. 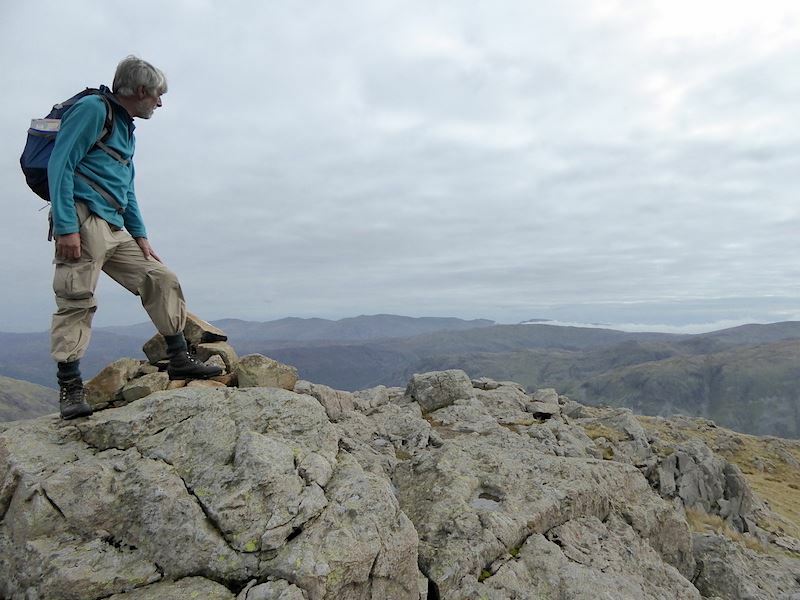 I realised he was assessing the scramble section and wondering whether to tackle it but I don’t know what conclusion he came to as I was having to concentrate on the loose path I was coming down and watching where I was putting my feet. The next time I looked over at where he had been standing he had gone. 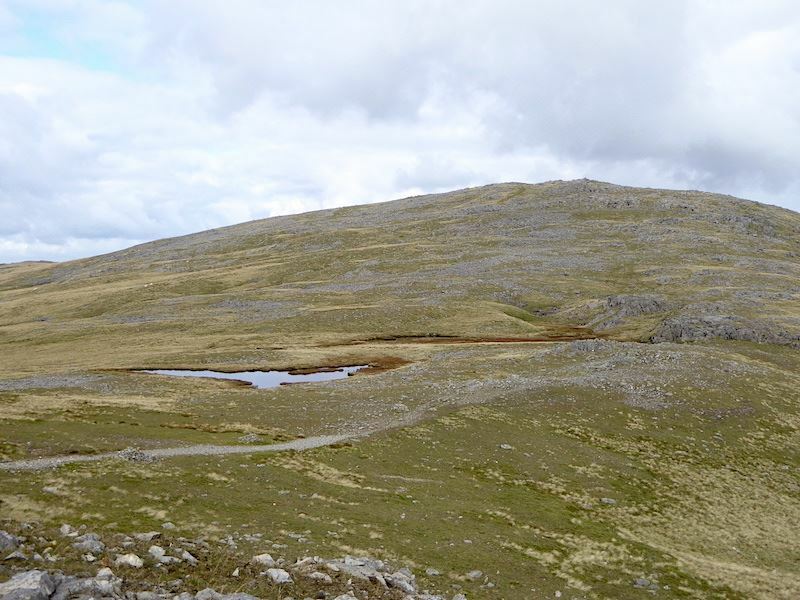 A view of Styhead Tarn on our left as we descend Windy Gap. 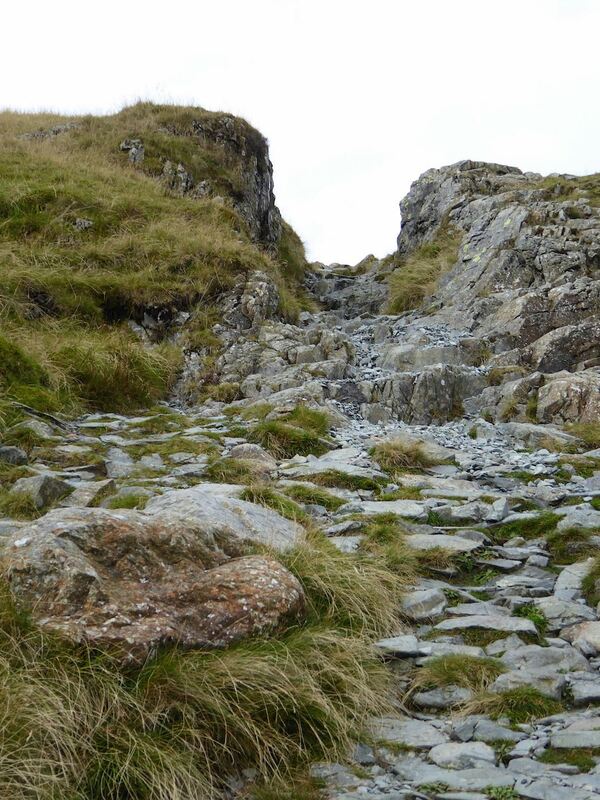 The descent needs care as the path down is loose and will slide away under your feet very easily, so you’d be on your backside and slithering down to the junction at the end of it before you could stop yourself. 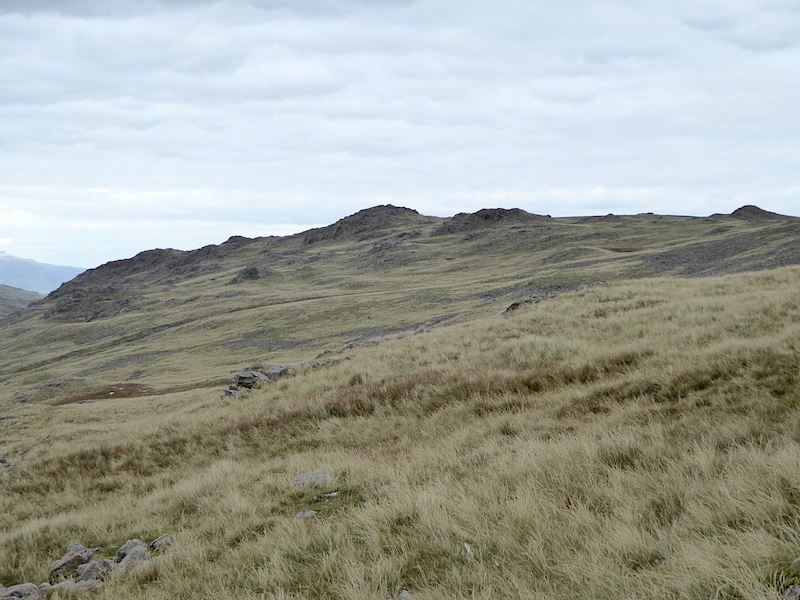 Safely down to Windy Gap which didn’t live up to its name today, no wind at all. 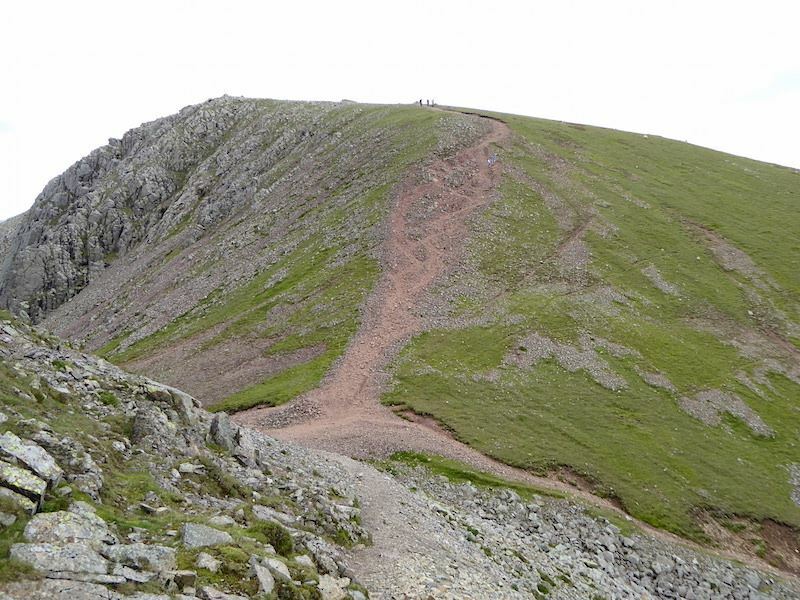 Climbing out from Windy Gap up to Great Gable. 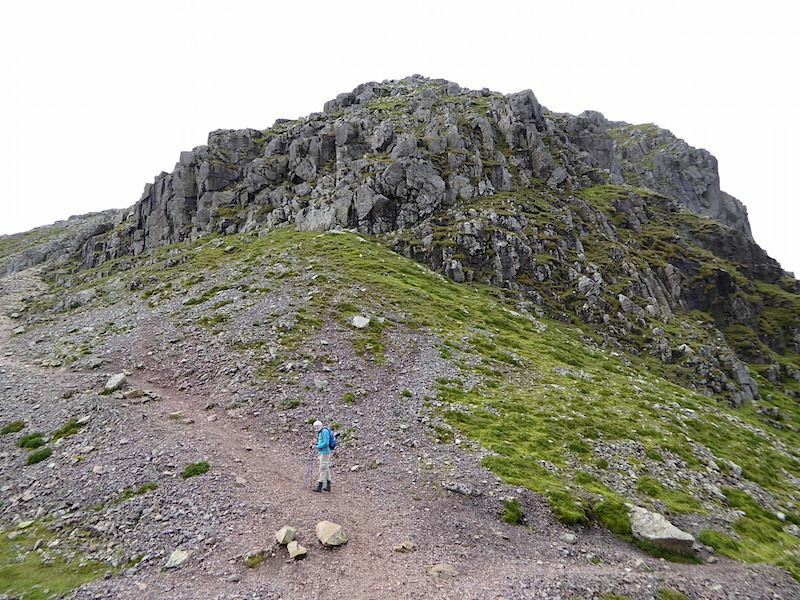 In about 500 feet we’ll be at the summit, best not to think about that and just keep putting one foot in front of the other until you get there. 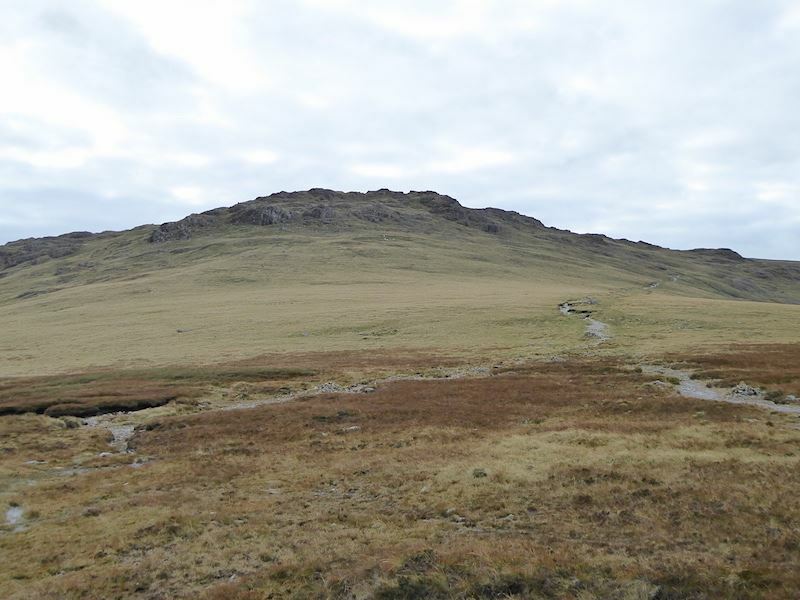 Higher up the path now and we begin to see Sprinkling Tarn above Styhead Tarn. We still have a path to follow, but that’s about to change in a couple of minutes. 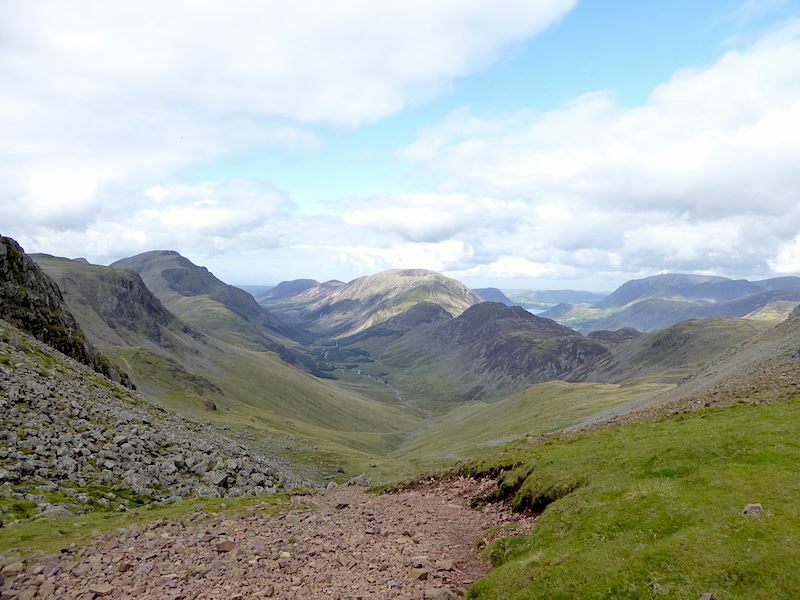 As we climb I take a look back down to Windy Gap and the path off Green Gable. 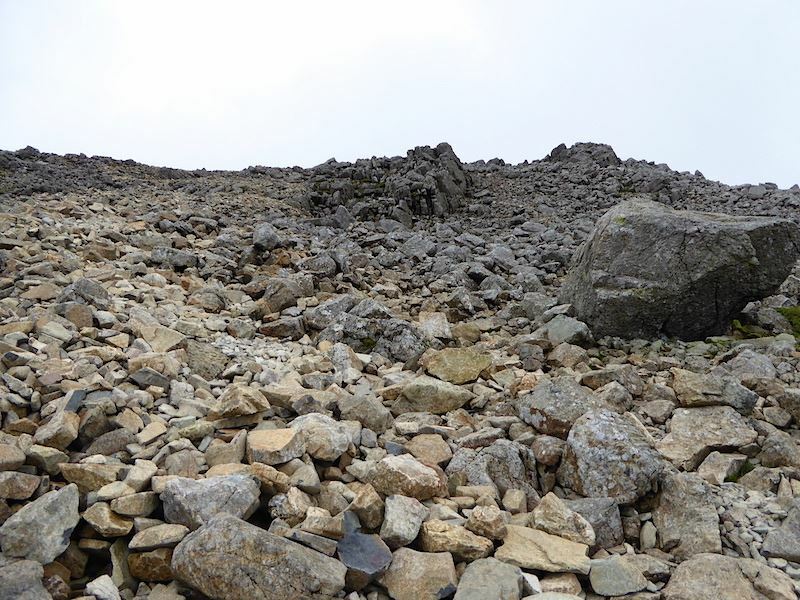 The path disappears amongst the jumble of boulders so its every man for himself for a while. 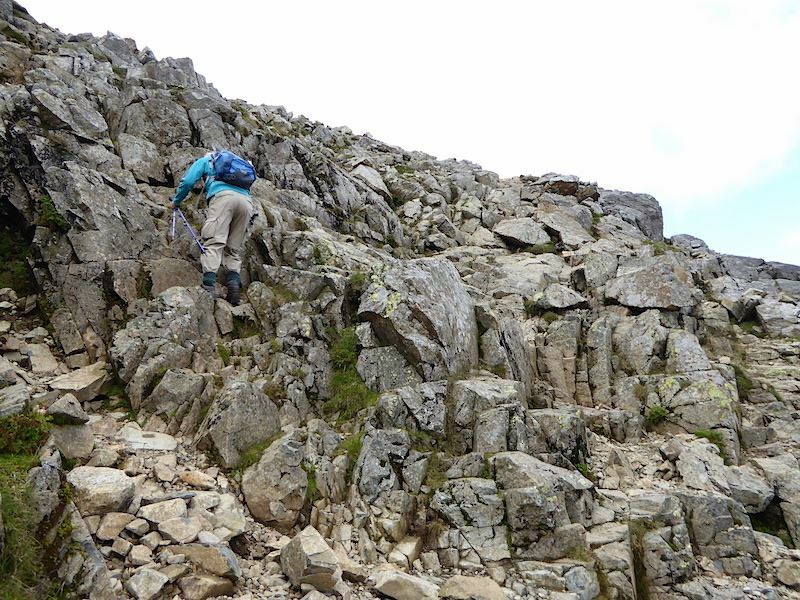 Its a good little scramble, perfectly safe and only lasts a few minutes, after which you are above it and able to stand on just two feet again. 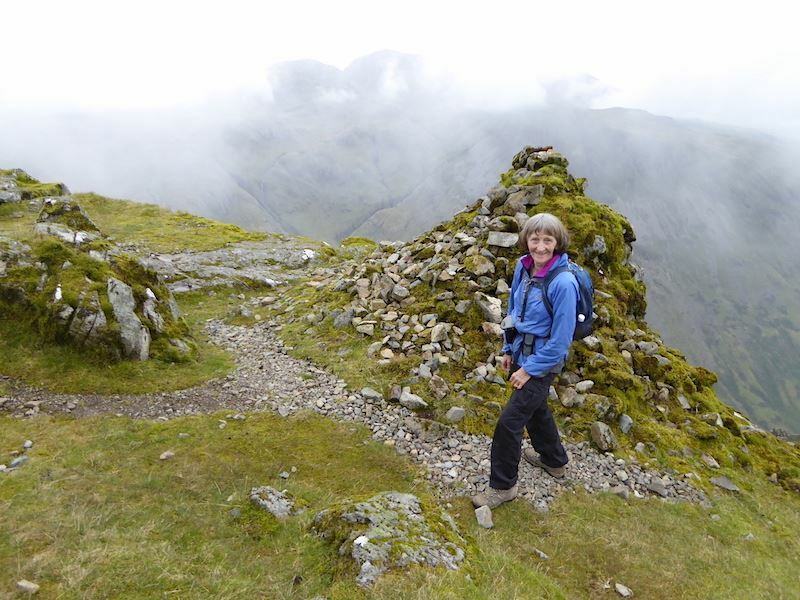 Great fun, especially as the rocks were bone dry and we could see where we were aiming for, it would be a different matter in rain and cloud though. 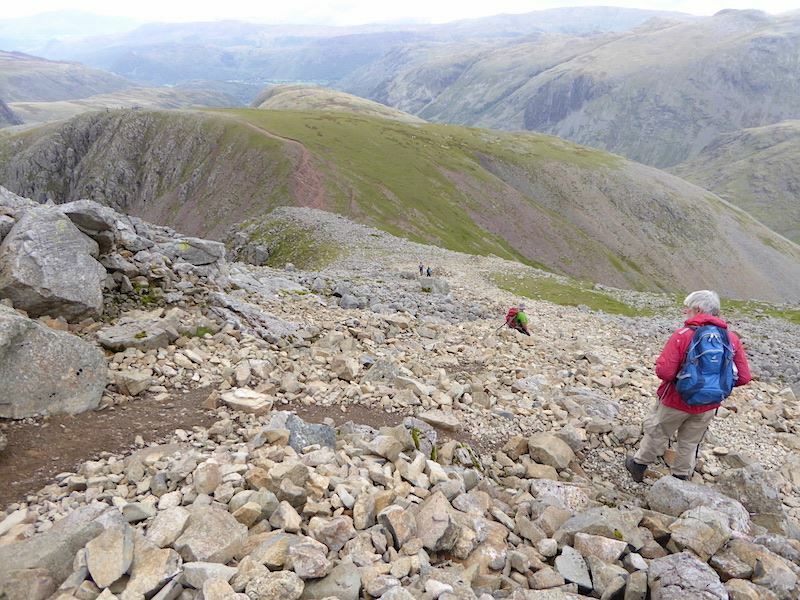 Safely over the scramble section and we’re now able to stand upright again and have a look down at the view. Turning around from the previous view for a rather less picturesque one. 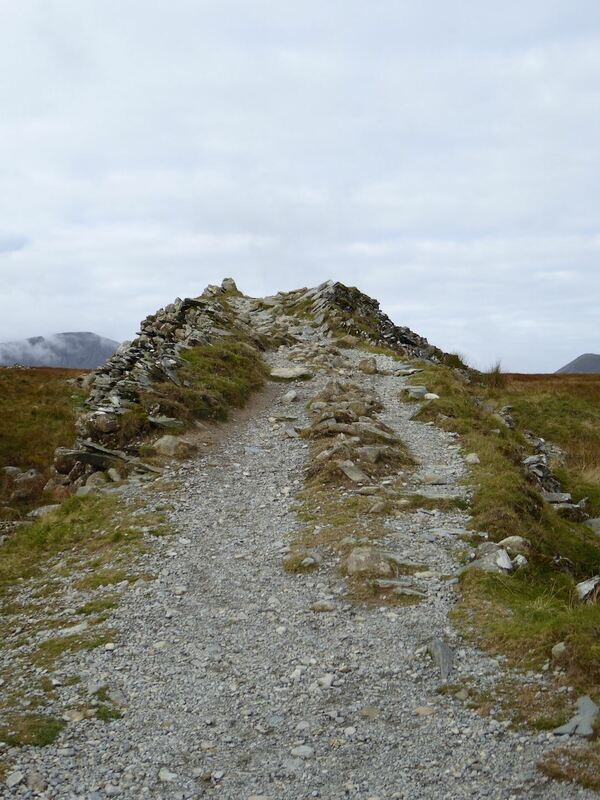 From here its steeply up over the rock strewn ground where progress can be slow since you need to make sure of your footing on the rocky rubble. 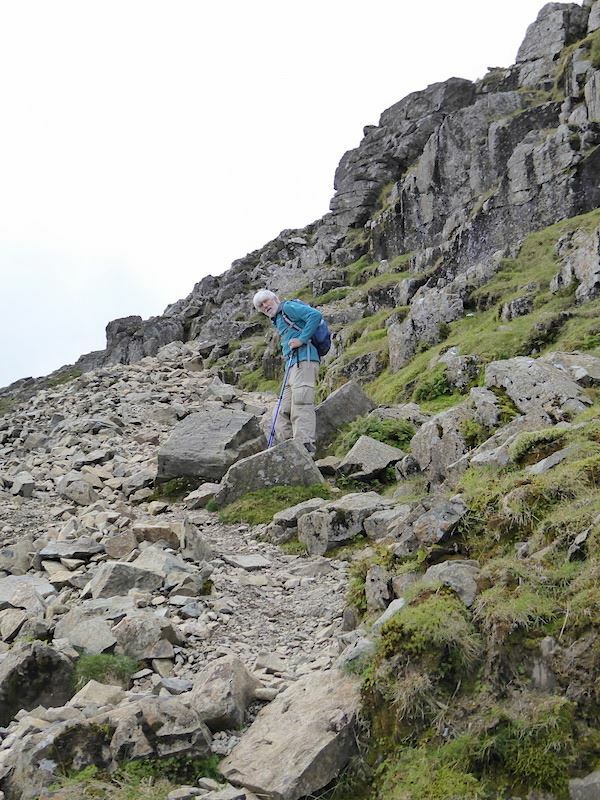 A pause for breath so a chance to look back at the steepness of the route. 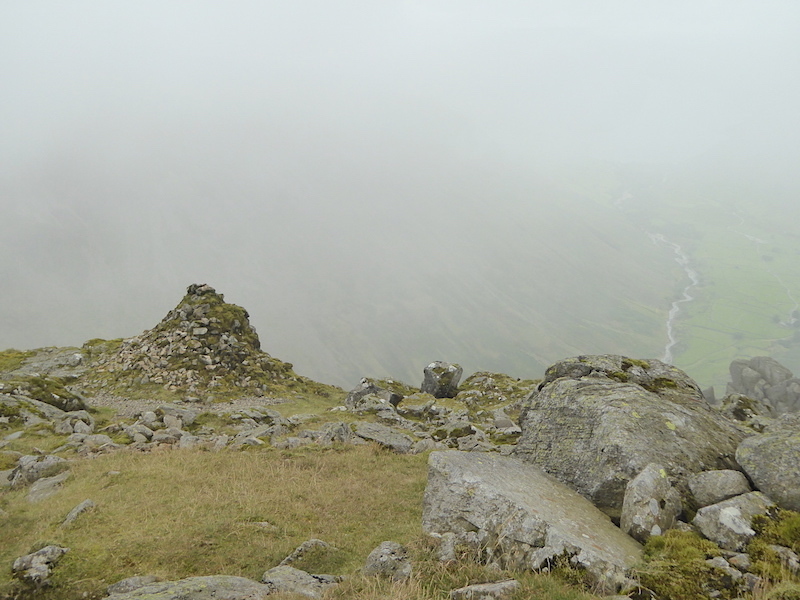 We could see the summit about 100 yards before us when I noticed something I really didn’t want to see – cloud and mist heading our way, seemingly out of nowhere dammit, and only five minutes from the top. 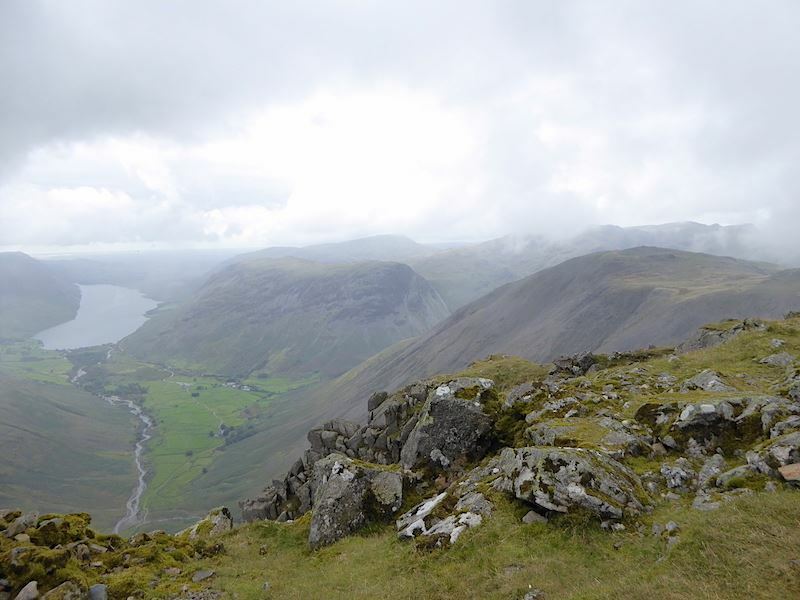 There won’t be those grand views down into Wasdale, what a bummer! As the summit area looked crowded we stopped here and had a bite to eat while waiting for the cloud to clear. 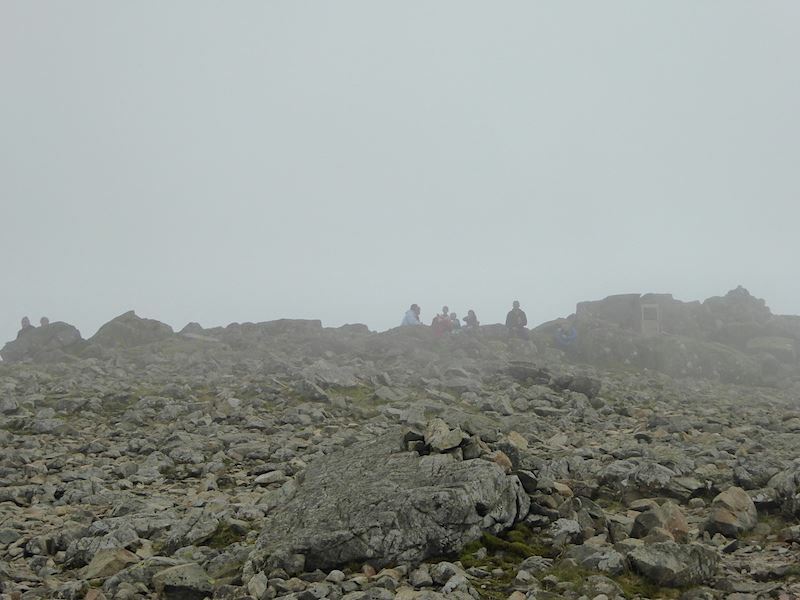 The cloud was still down by the time we’d eaten so we decided to continue on up to the summit anyway, view or no view. 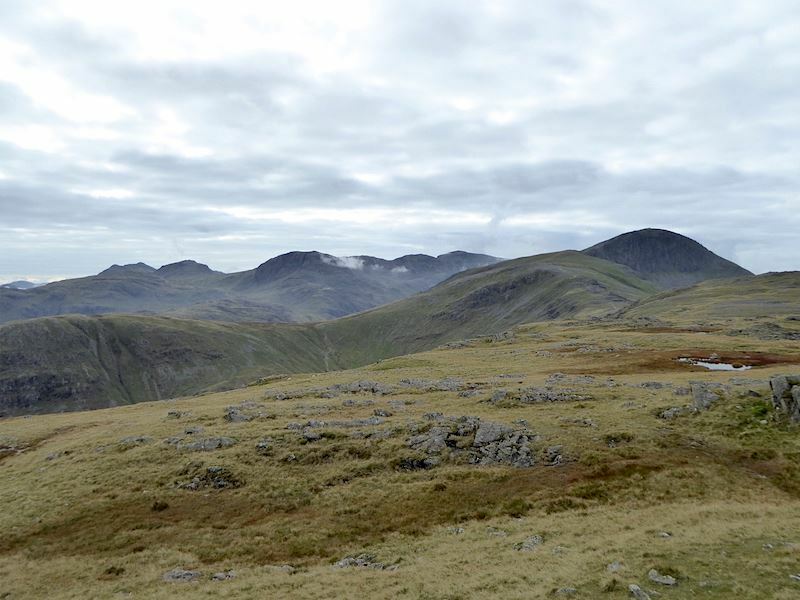 A brief gap in the cloud gave us a distant view of Blencathra over there on the centre of the skyline. 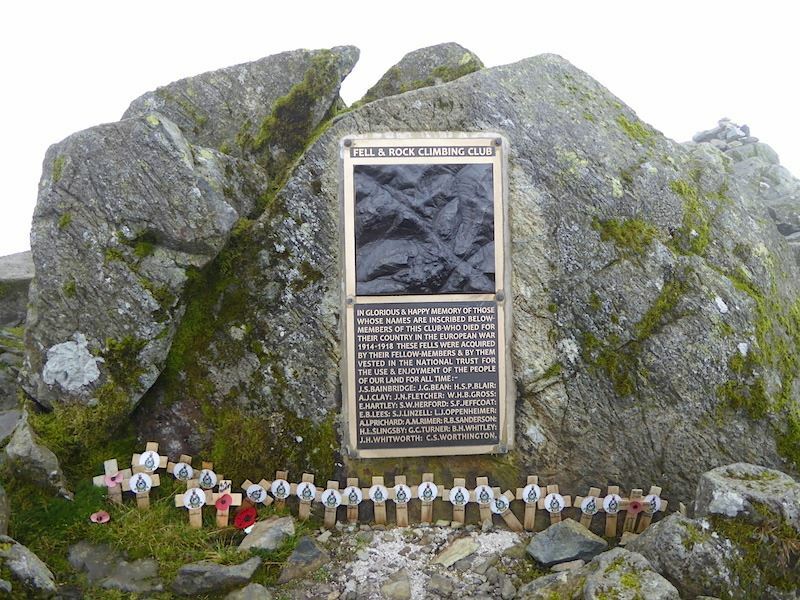 The Memorial Tablet on Great Gable, still with the crosses of remembrance from last November’s gathering, no vandalism here. 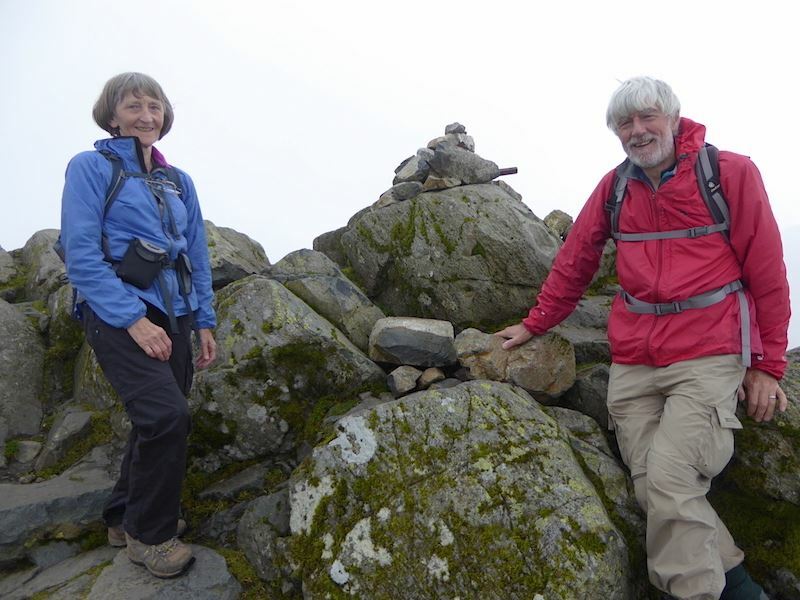 The two of us on Great Gable summit, another walker very kindly offered to take it. 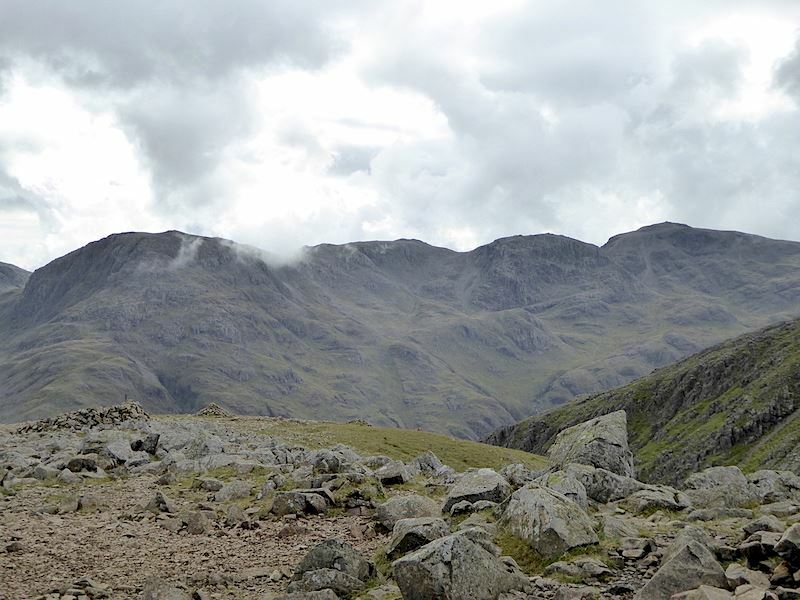 The cloud clears a little to give us a view of Scafell Pike up there on the right. 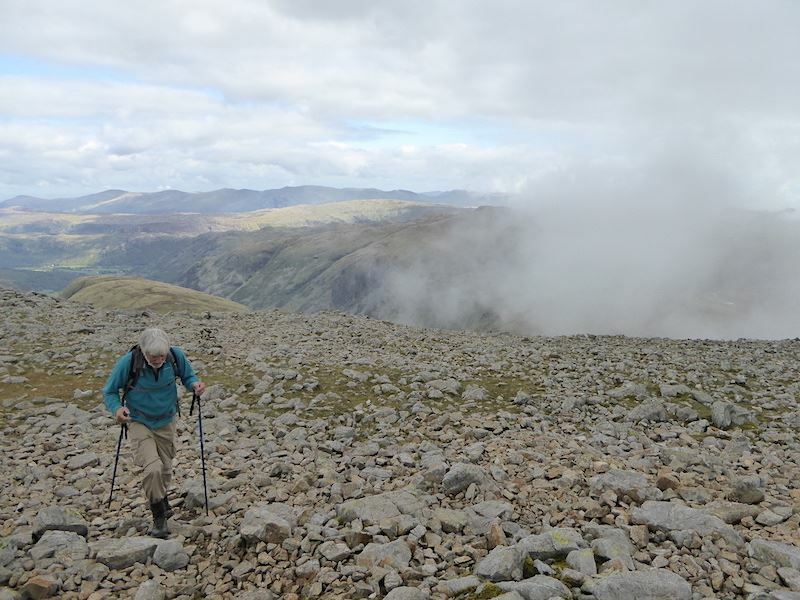 With fingers crossed we make our way down to the Westmorland Cairn and hope the cloud clears. 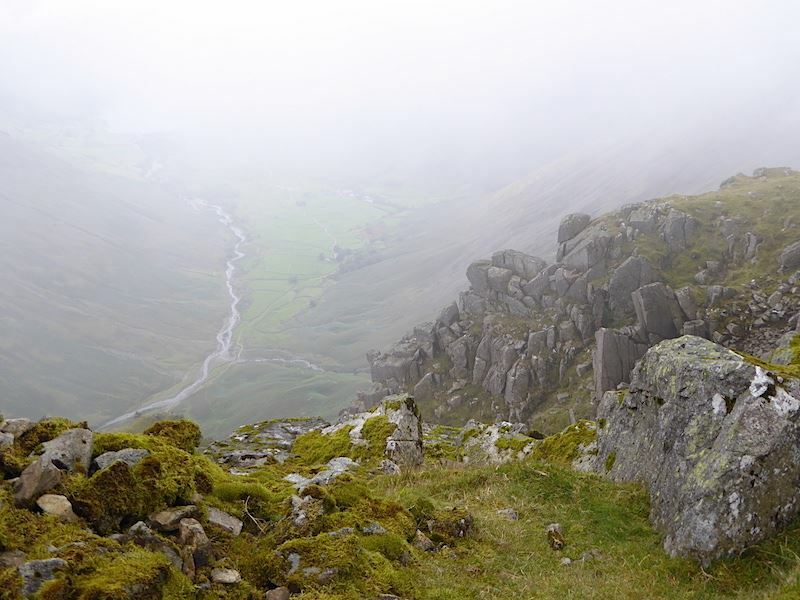 Yes, its clearing, we can see Lingmell Beck down there. 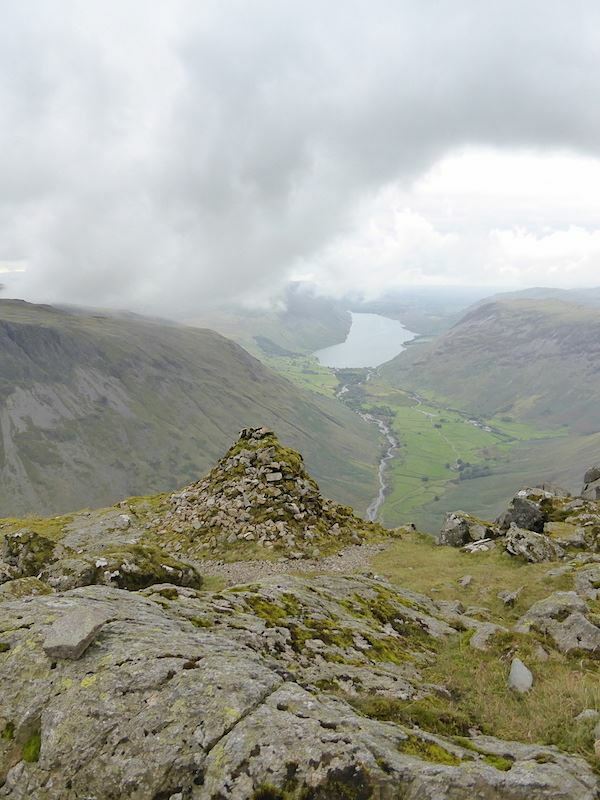 A view down the almost vertical southern face of Great Gable overlooking Wasdale. Peering down at the Great Napes and its a very long way down to the bottom. I was being urged to come away from the edge at this point. Cloud is still swirling around but the view is there just as I’d hoped. 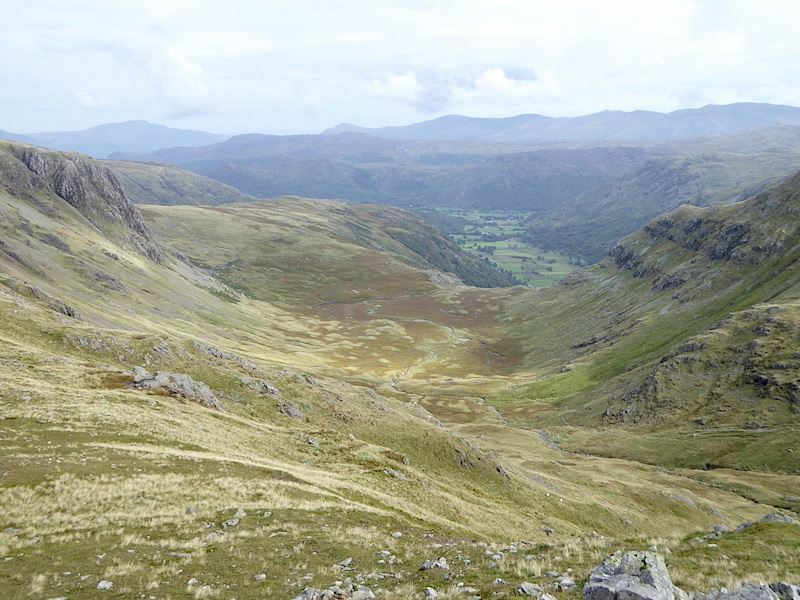 Its reputed to be the finest view in the Lake District. 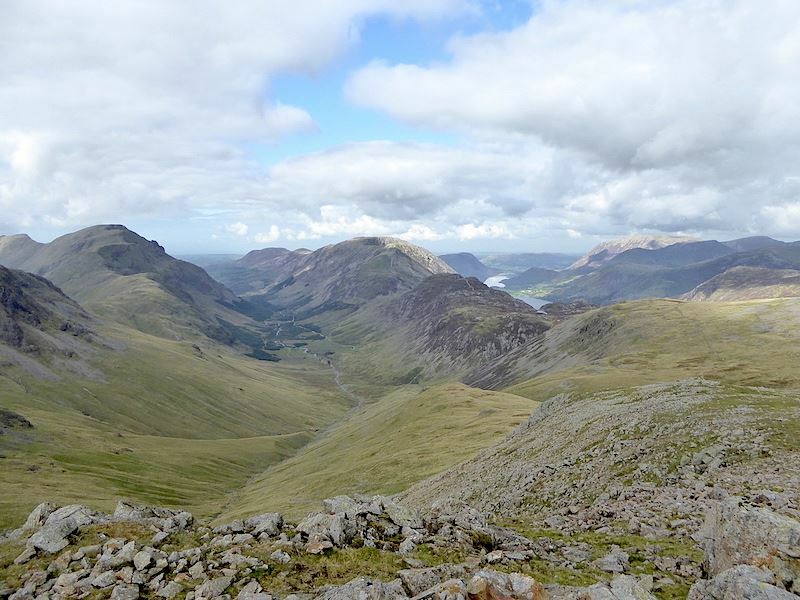 A better view down to the Great Napes and the steep scree slopes alongside them. Back to that stupendous view from the cairn. 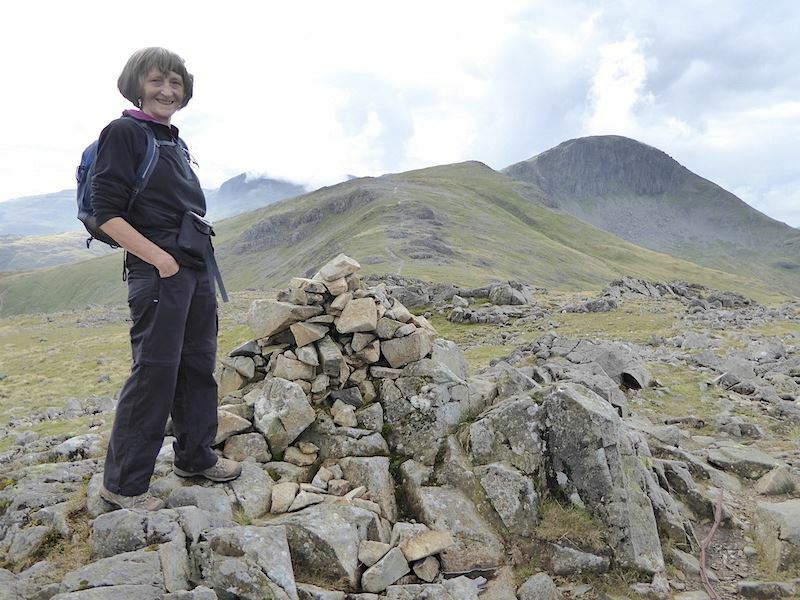 Finally persuaded to stand by the cairn. Understandably scary as its perched on the edge and its a long way down. 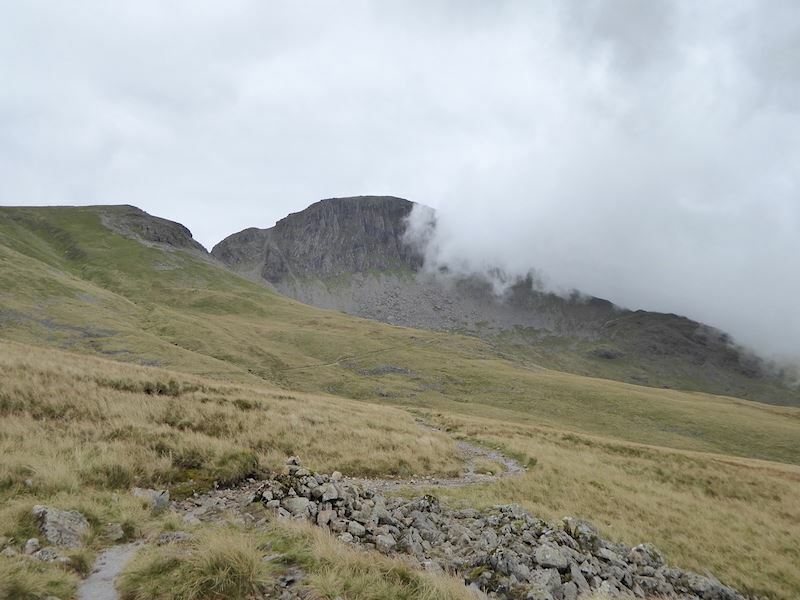 I was hoping for a view of Scafell Pike in this shot but the cloud came back. 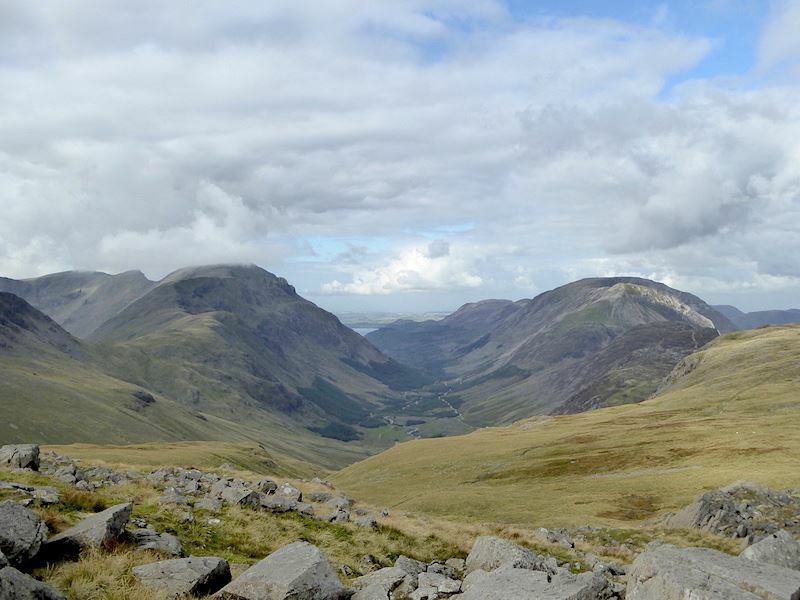 A longer view down to Wasdale Head and the surrounding fells. Things got a little clearer so I took another shot before we left the cairn. 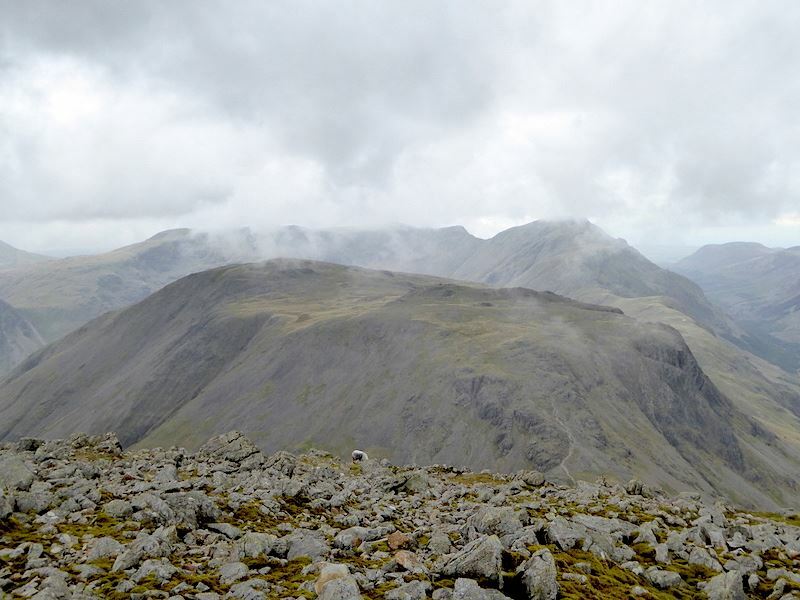 We left the summit of Great Gable and wandered over to have a view of Kirk Fell. 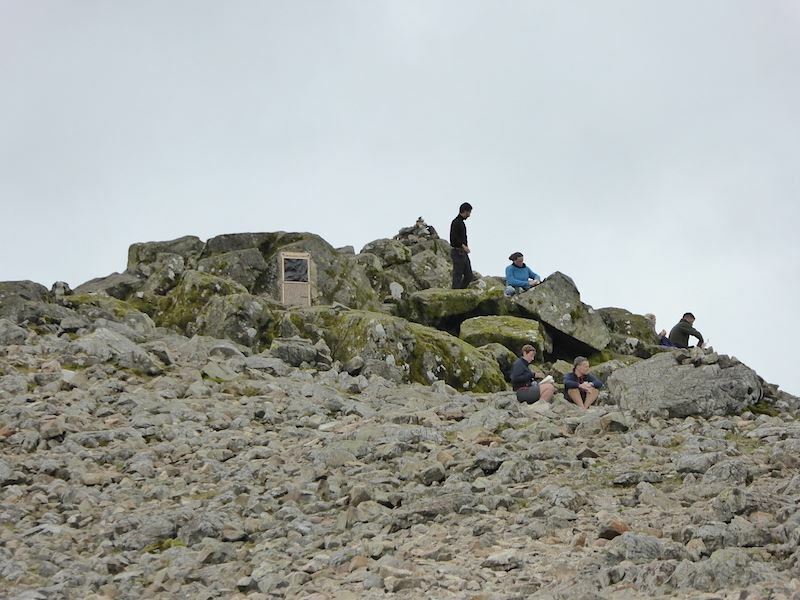 Before we left I zoomed in on the summit area, still full of walkers eating their lunches. 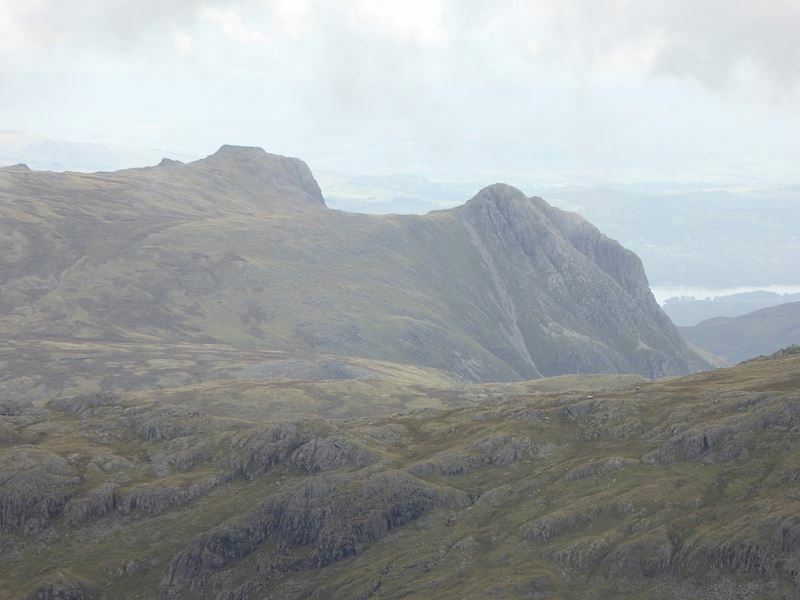 Another zoom to look at Pike O’Stickle and Loft Crag on the right and Harrison Stickle on the left. Here we go again, returning by the same route. Its no easier descending so its bottom gear going down as well up. 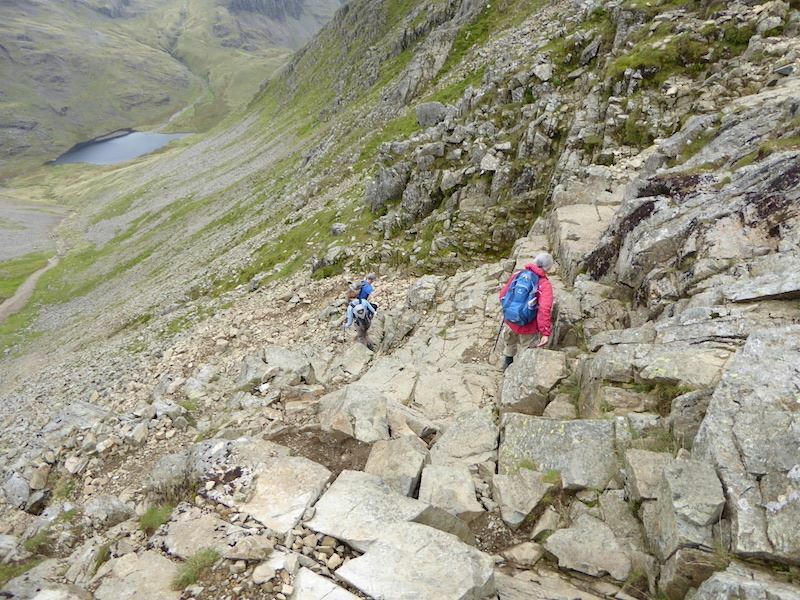 Now going back down over the scramble section. In addition to hands and feet there is one other part of the anatomy which comes in very handy in situations like this, especially if you don’t have long legs. 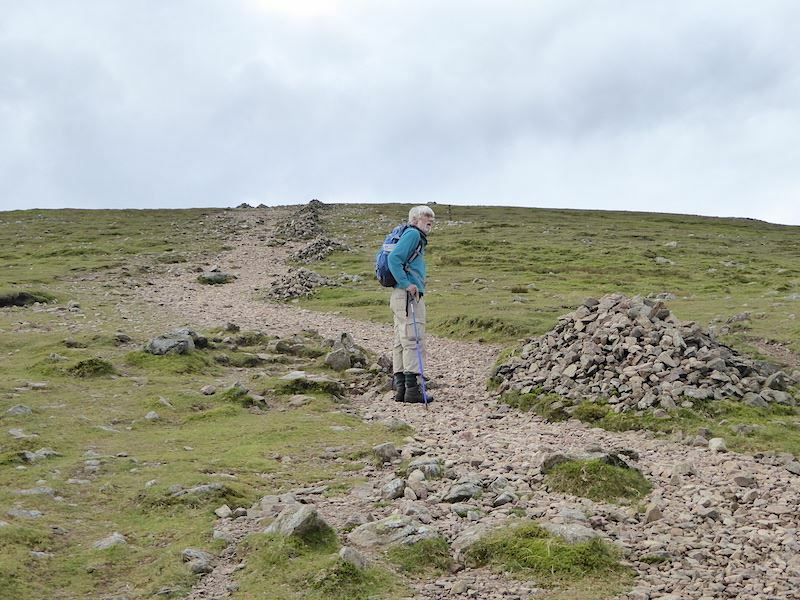 At Windy Gap we turned down the very loose stony path, it became more like ski-ing than walking at times. Slow but steady progress down Windy Gap. 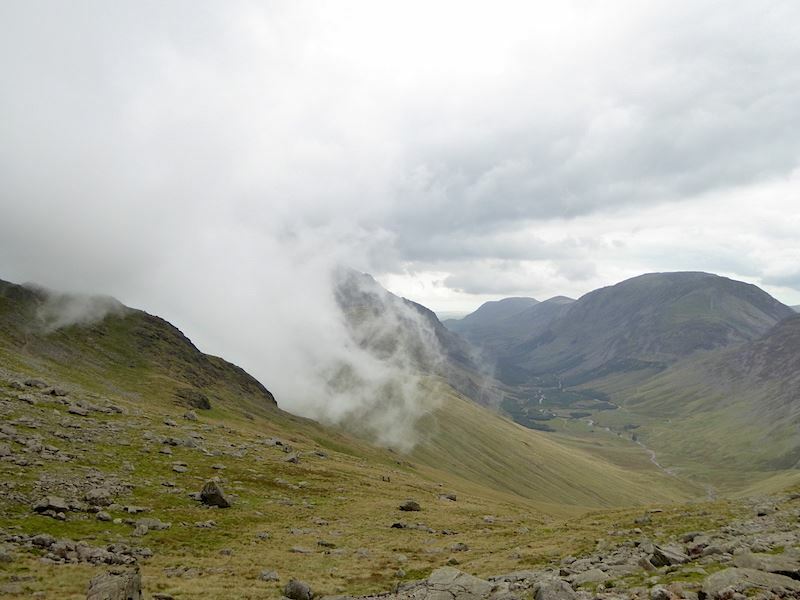 Suddenly, and quite dramatically, cloud begins to roll through between Great Gable and Kirk Fell. 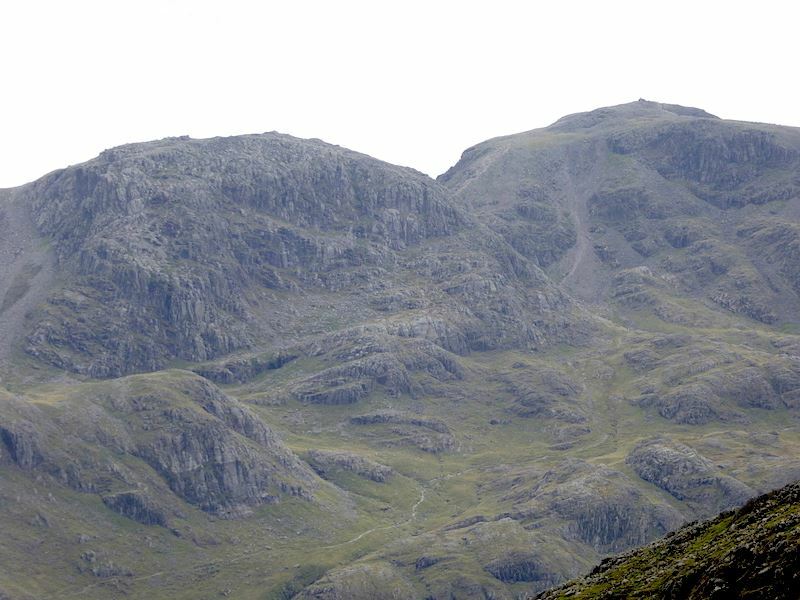 Four walkers giving some scale to Gable Crags. 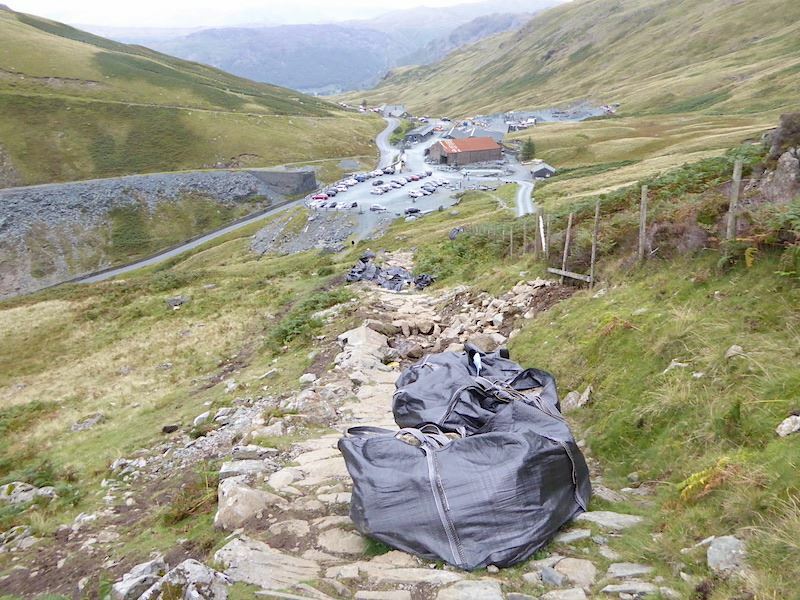 They are about to go up Windy Gap, I think they might find that to be rather like trying to walk up the ‘DOWN’ escalator. Cloud now streaming through from Beck Head and we were expecting to be enveloped at any minute. 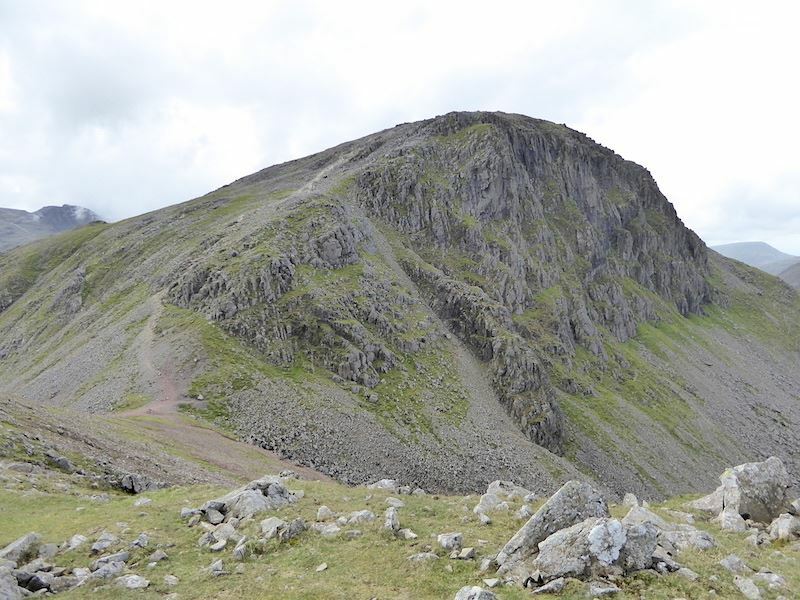 Green Gable still visible but Great Gable is rapidly disappearing. Fortunately it didn’t come drifting our way. 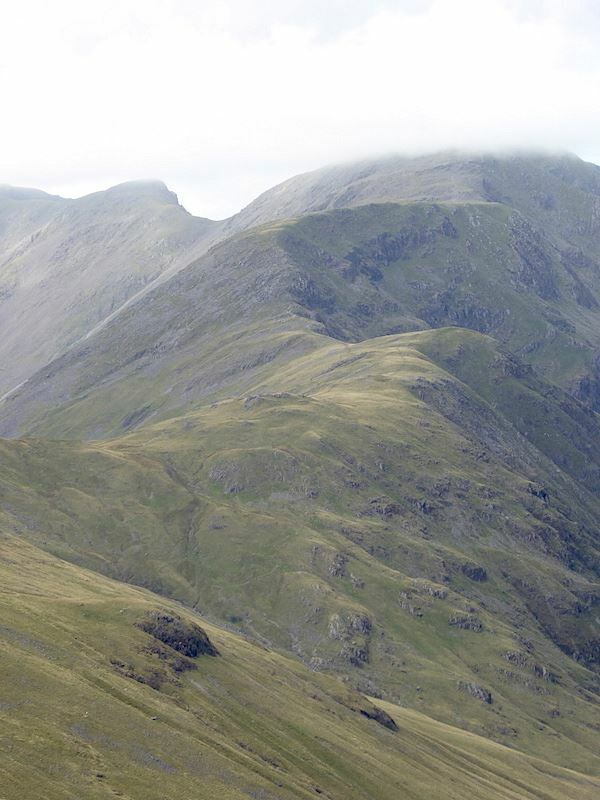 We’re on our way back to Honister and passing below the aptly named Grey Knotts. The grey cloud built up and moved steadily across during the afternoon. It was very mild despite the chilly looking greyness of everything. 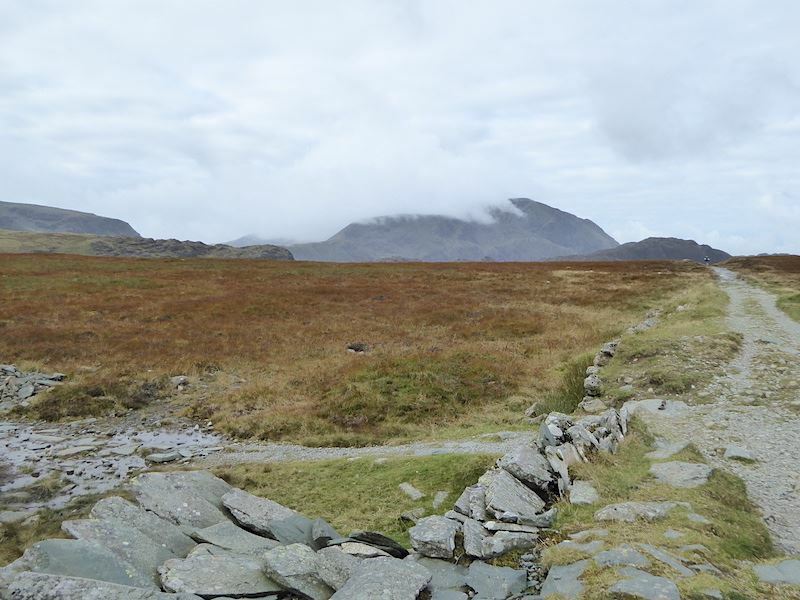 Looking back at Grey Knotts as we near the old winding house …..
….. and from there we return to the Honister slate mine. 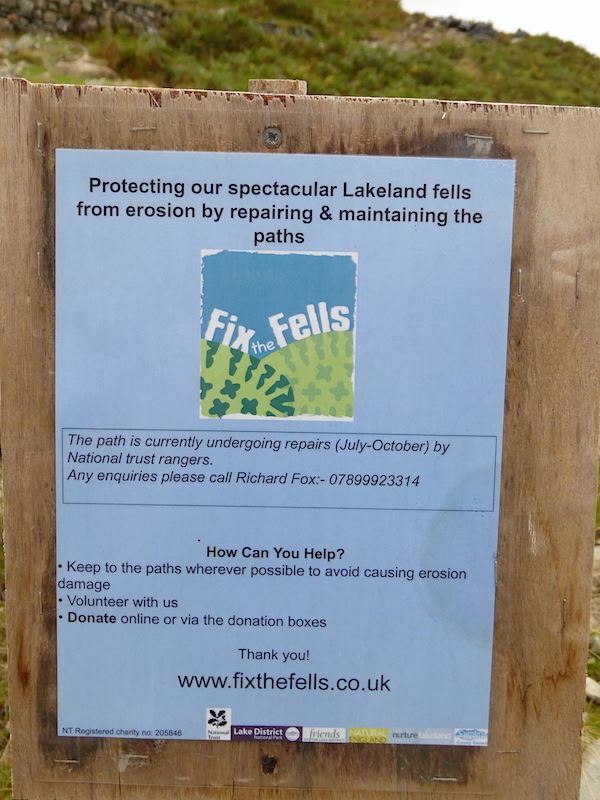 They’re fixing the fells again. Should be fixed by the end of October then. 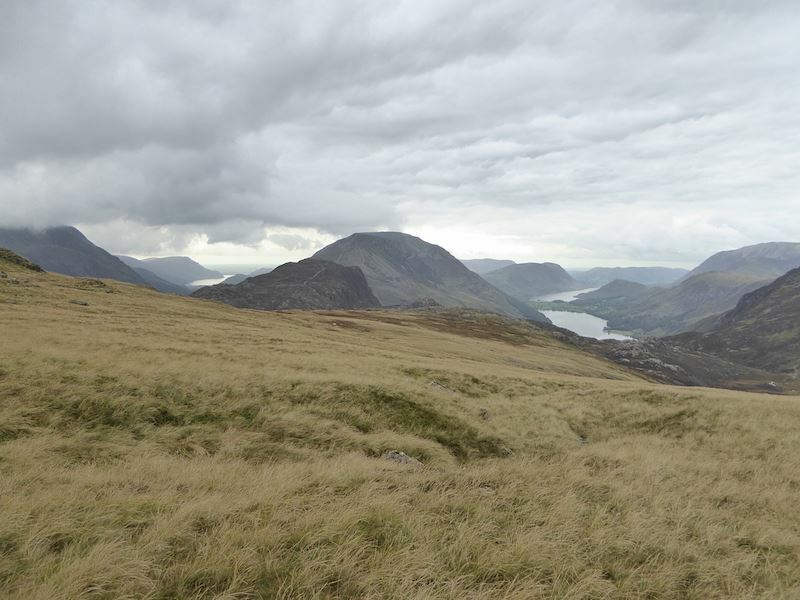 We continued on down back to Honister, changed out of our boots, and made our way back home. 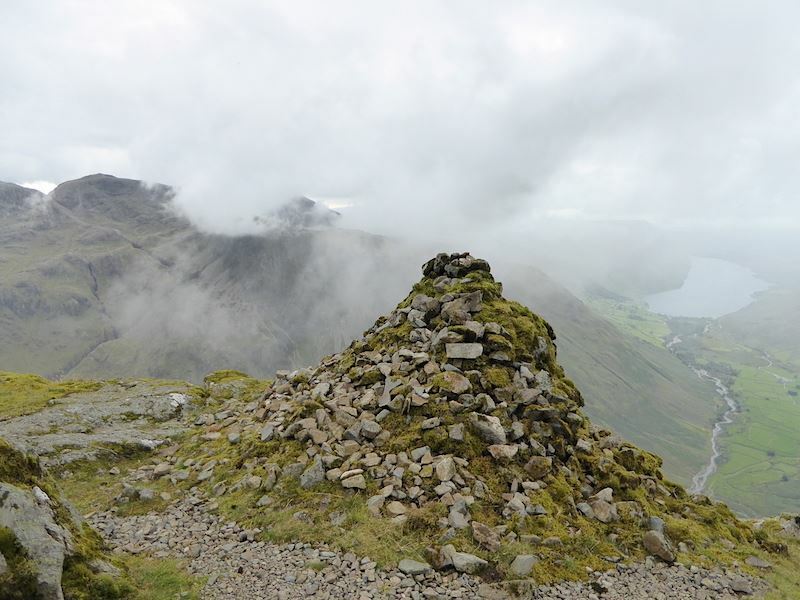 I really enjoyed this walk, the weather was just right, the views were wonderful, and I made it to the Westmorland Cairn and saw the view I didn’t see last time we were here. Only a small success in the grand scheme of things but no less satisfactory, its always good to fulfil an ambition no matter how small it is..